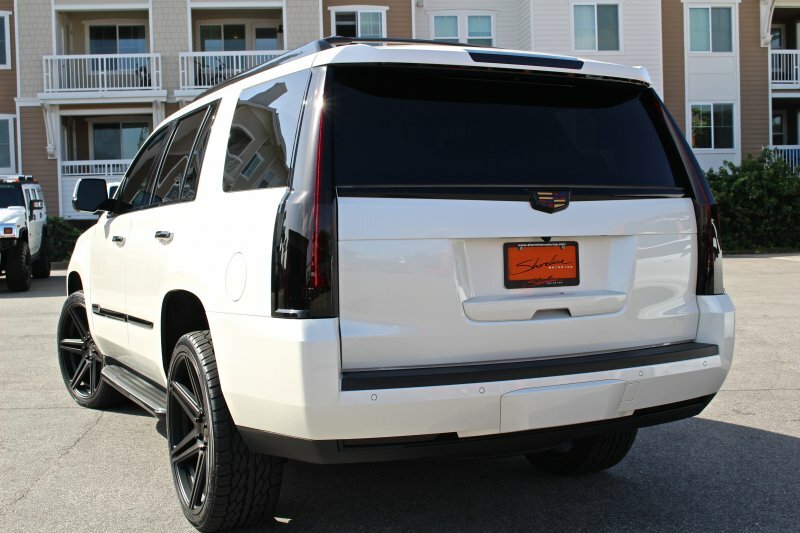 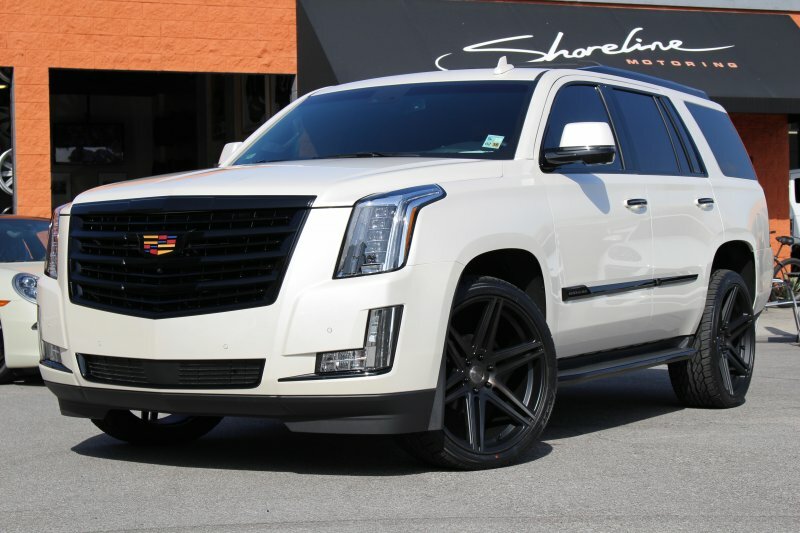 Escalade in for 24" Dub wheels, Pirelli tires, custom painted trim, smoked tail lights and a PedalBox. 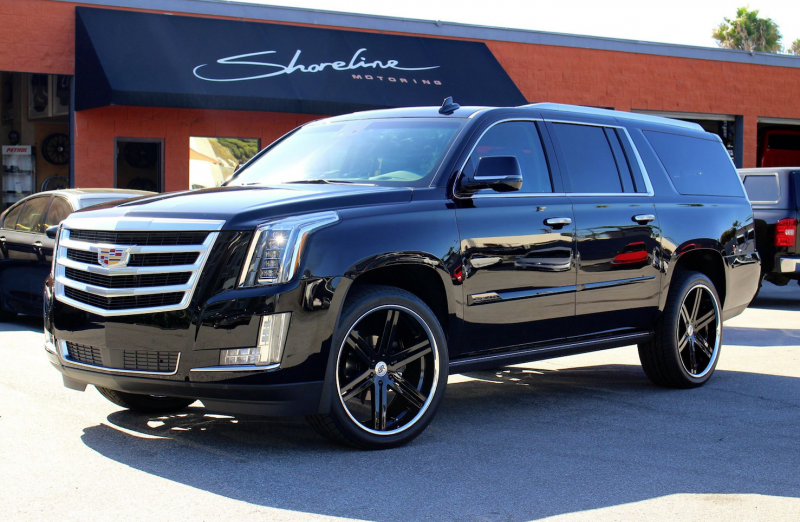 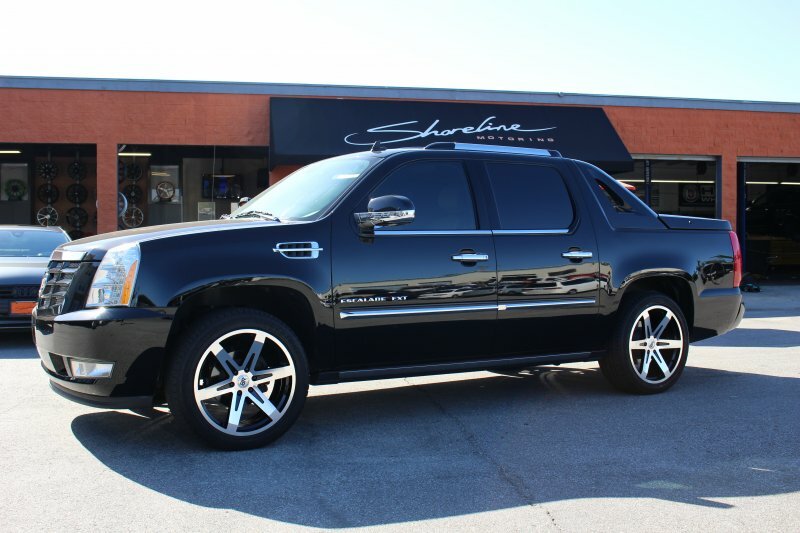 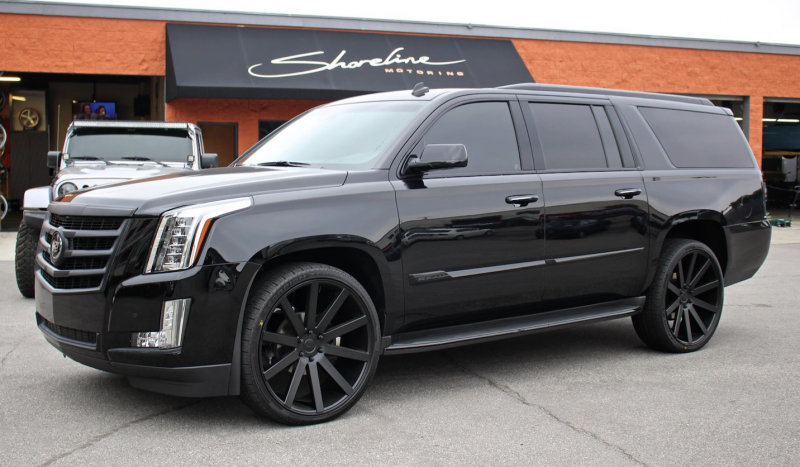 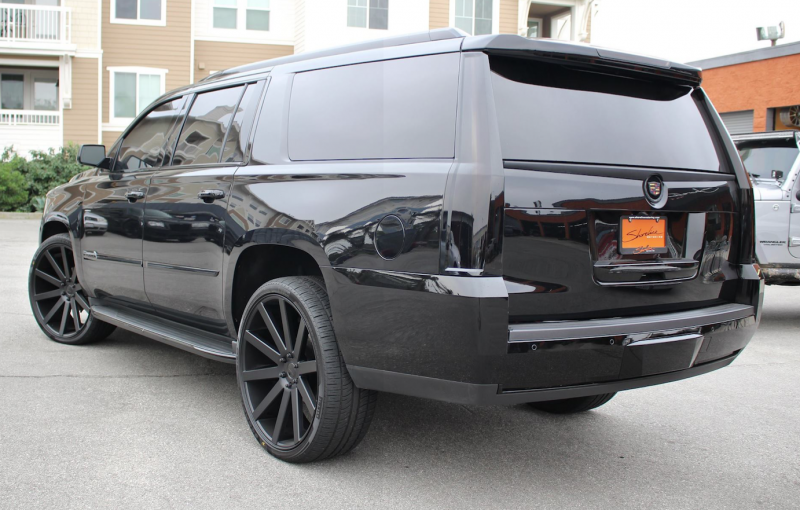 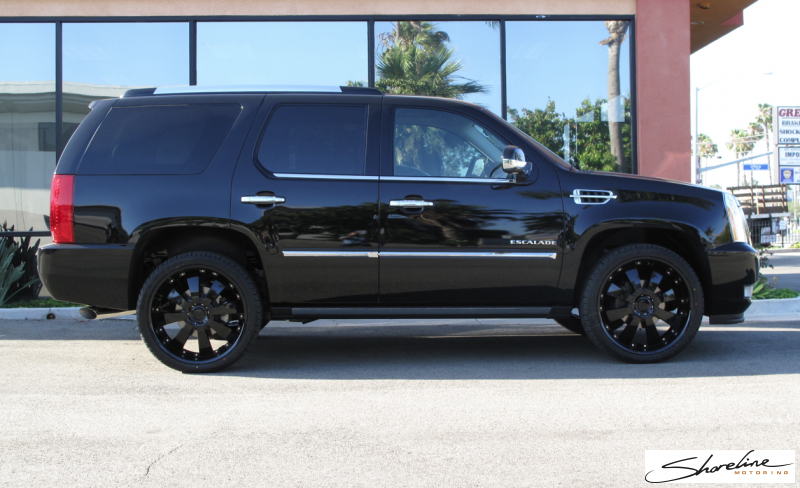 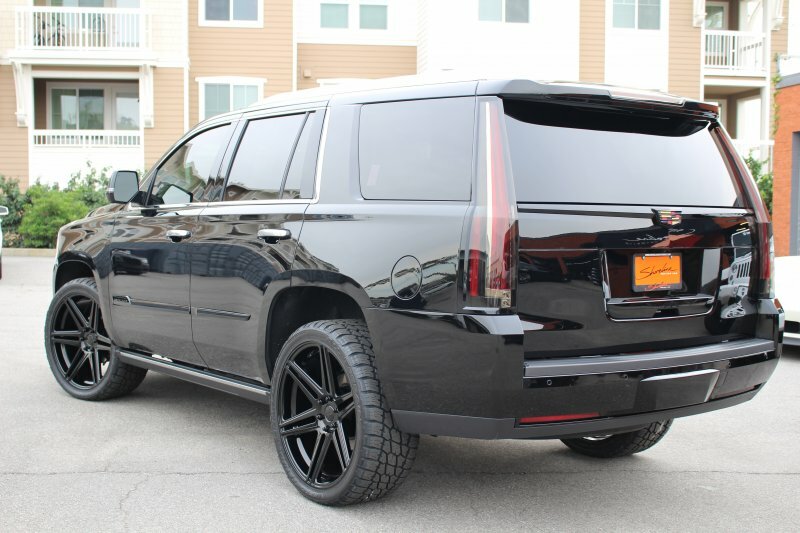 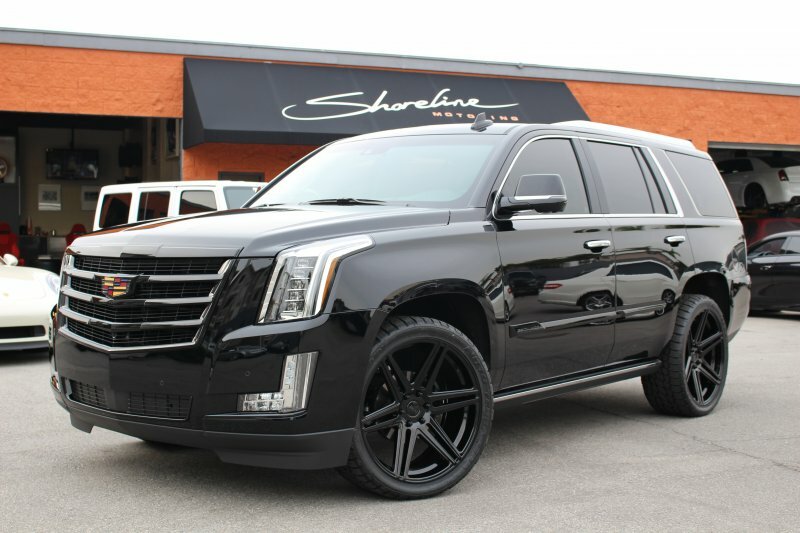 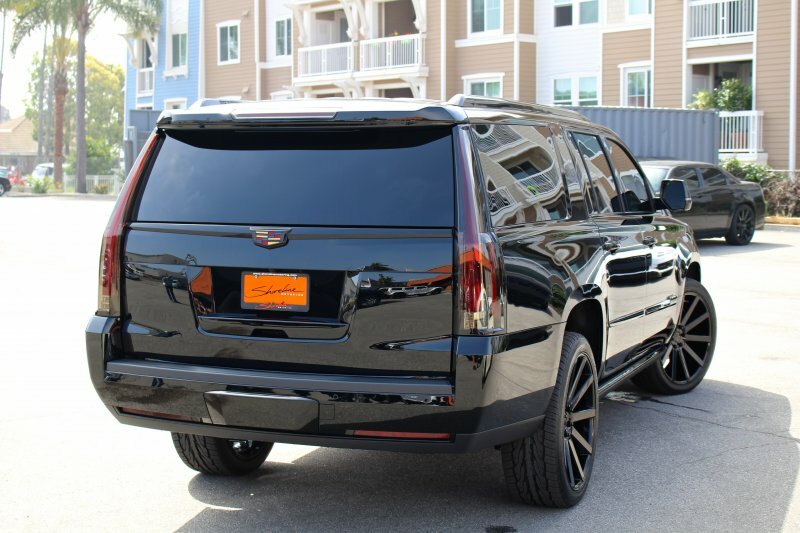 This Escalade is looking mean with its gloss black 24" Dub wheels. 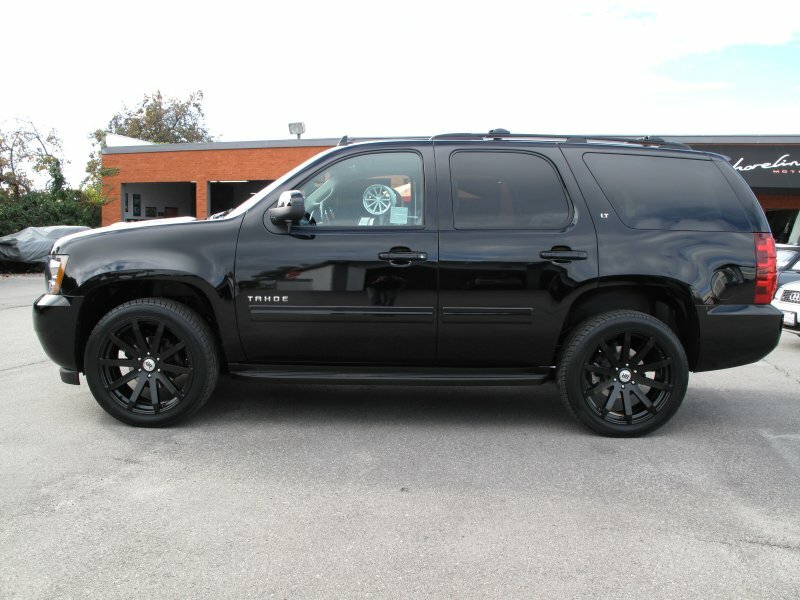 The Beast! 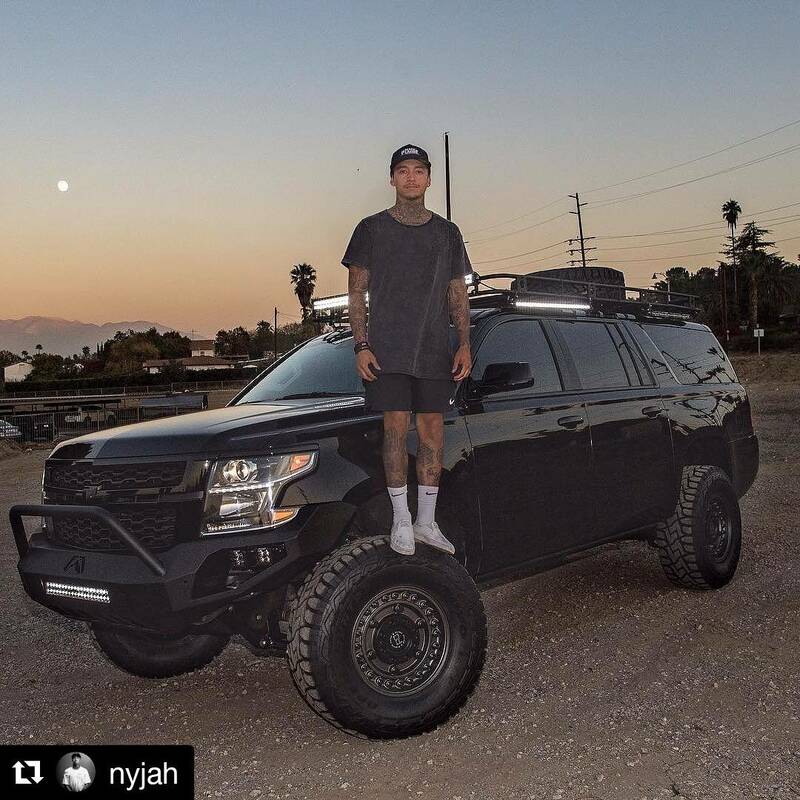 We transformed this Suburban for long time client Nyjah Huston. 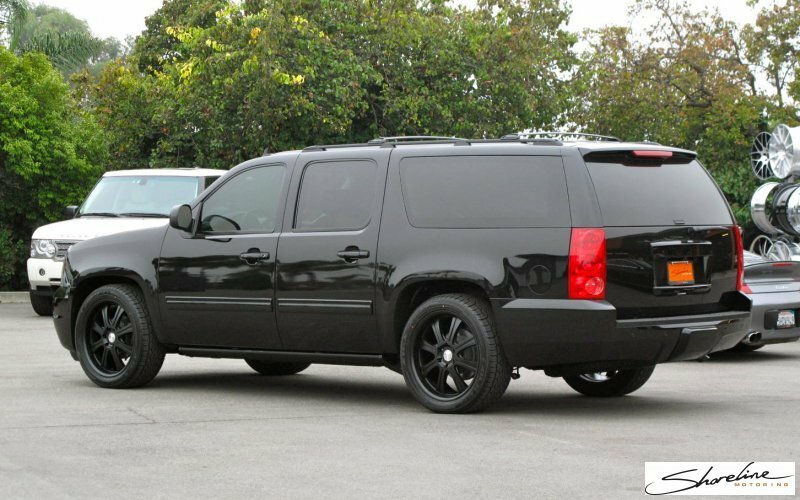 Urban Assault is what he was going for on this one. 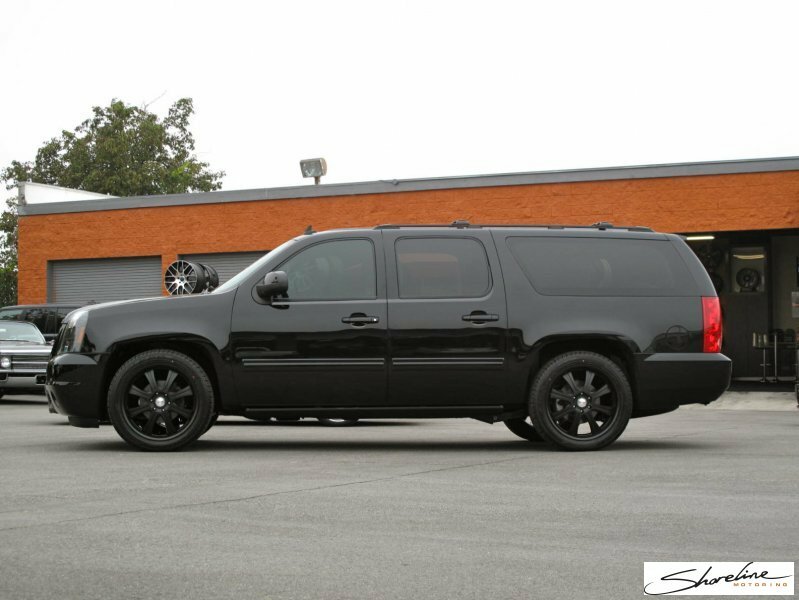 First thing was to get it up in the air, a 6" BDS suspension took care of that, 20" Black Rhino wheels wrapped in 35" Toyo R/T tires took care of the rolling stock. 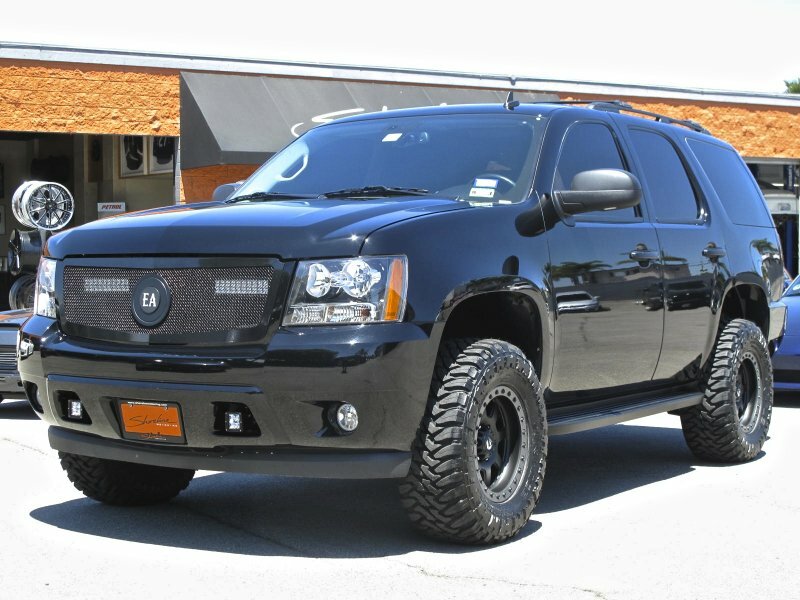 Front armor comes from Fabfours bumpers, we then added a custom roof, enough Rigid Industries LED lights to turn night to day, Amp Research power steps and of course he got a PedalBox performance upgrade to compliment the Magnaflow exhaust, last but not least trim received the full painted black-out treatment. 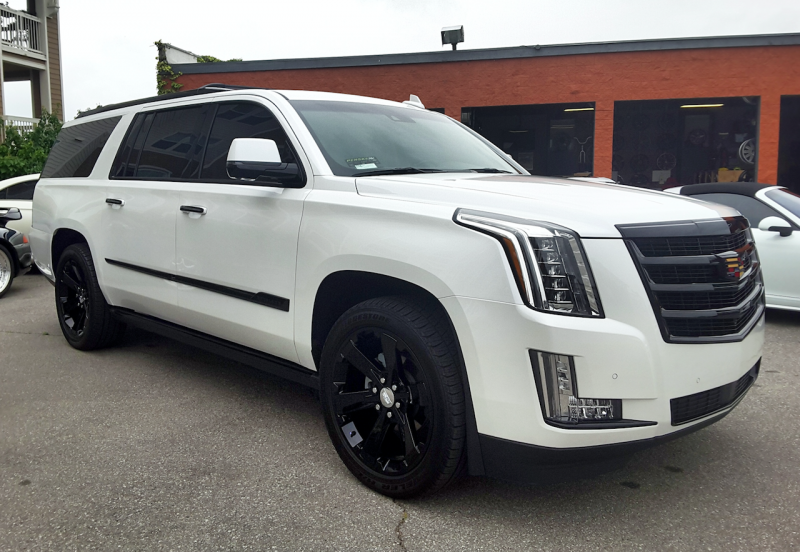 2015 Escalade with custom painted trim accents, tint, smoked rear lights and 24" custom wheels from MHT wrapped with Nitto Terra Grappler tires. 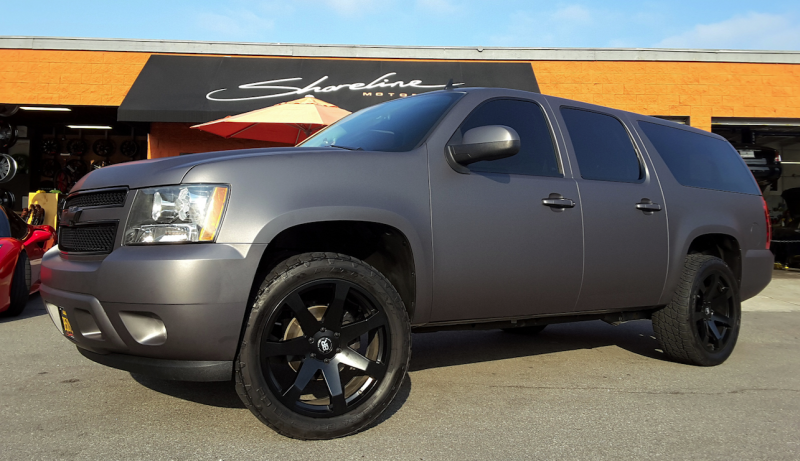 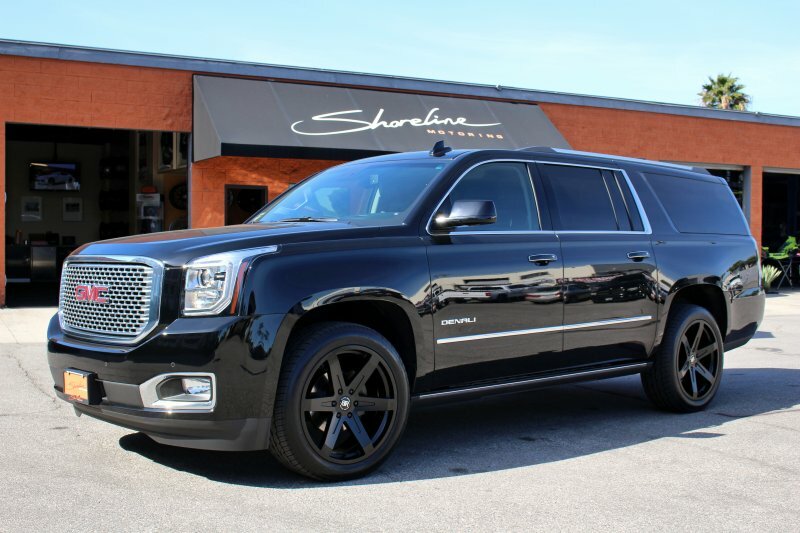 Suburban in for a full matte charcoal wrap, 22" Black Rhino wheels, Nitto tires and a PedalBox performance upgrade. 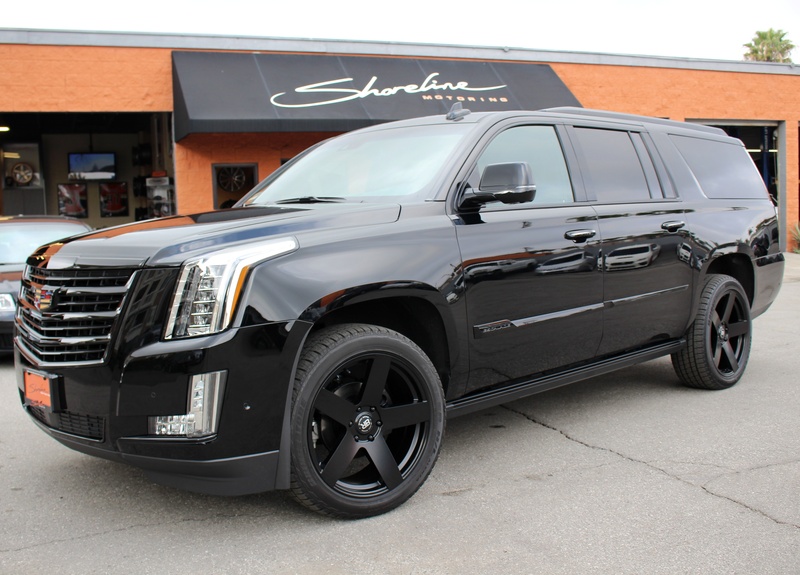 '16 Escalade upgraded with 24" Dub wheels with Double Dark tint finish and a PedalBox Performance upgrade. 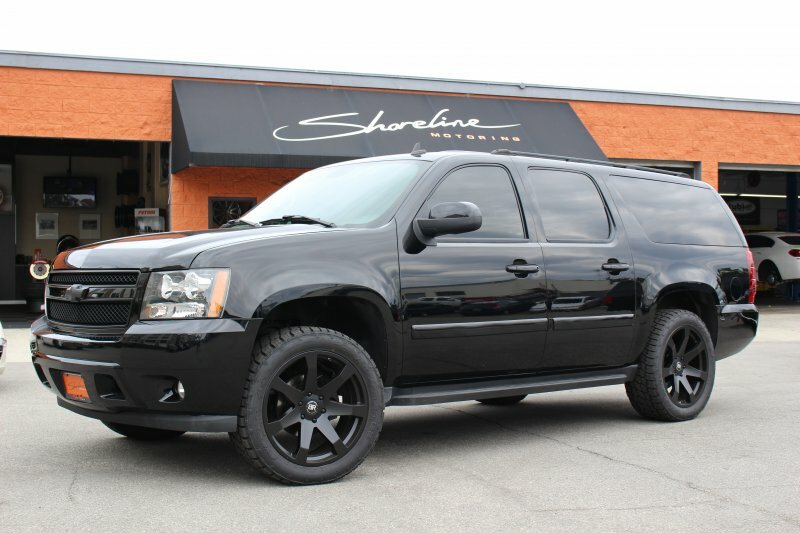 24" Dub Skillz, leveled rear suspension and PedalBox performance upgrade. 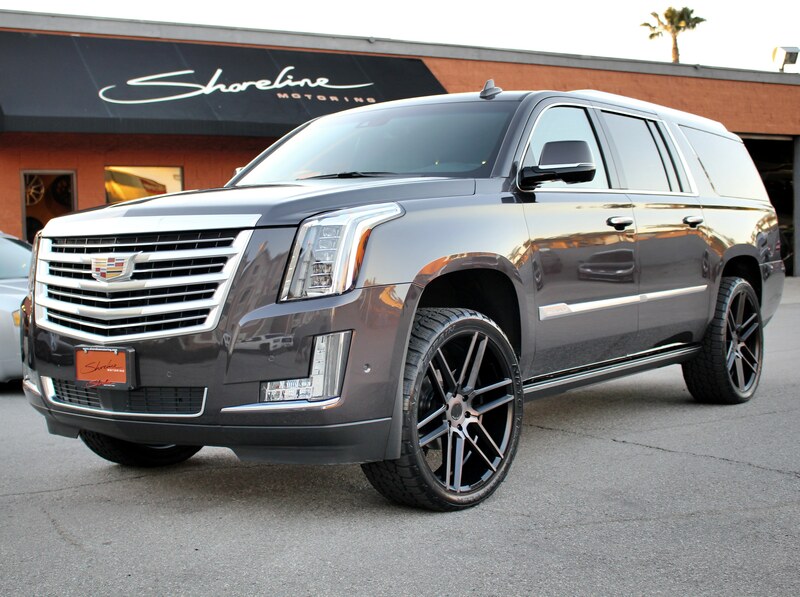 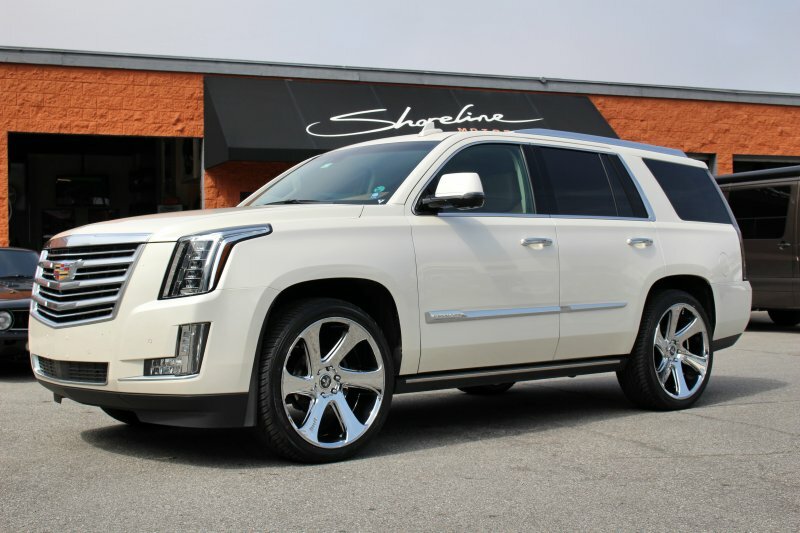 2015 Escalade in for 20" Fuel "Trophy" wheels, Toyo A/TII tires, custom paint work and a PedalBox. 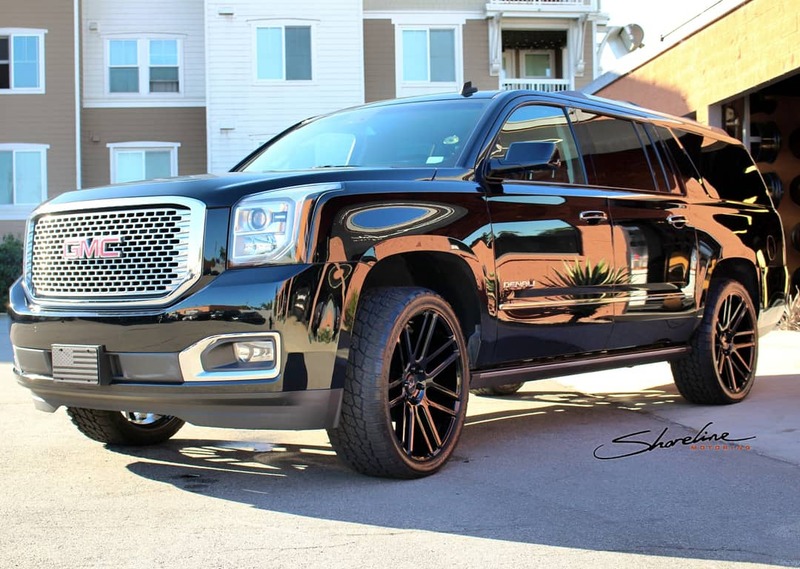 22" Black Rhino wheels make this Denali quite unique! 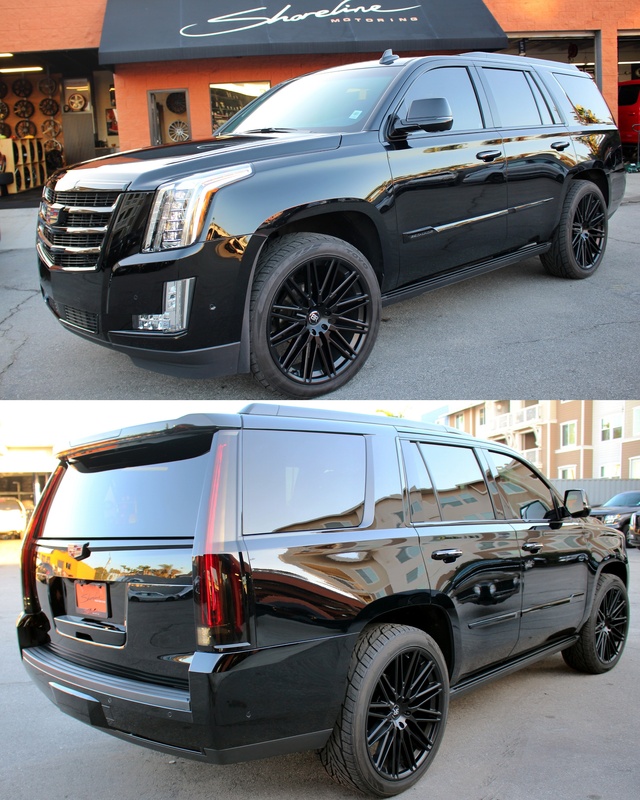 Blackout Edition 2015 Escalade, all trim has been removed and painted gloss black, 24" custom wheels from MHT with Toyo Tires, tint and a few other custom touches round out the package. 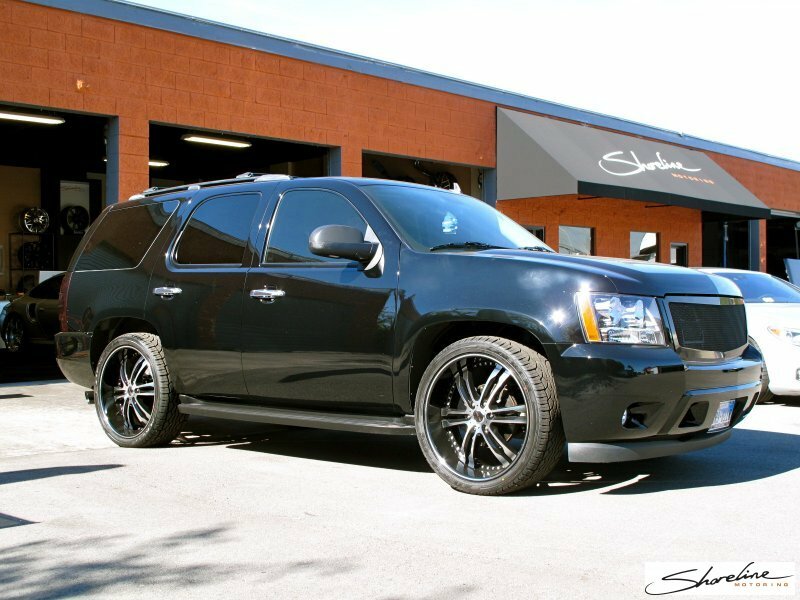 2016 in straight from the dealership for a black out package. 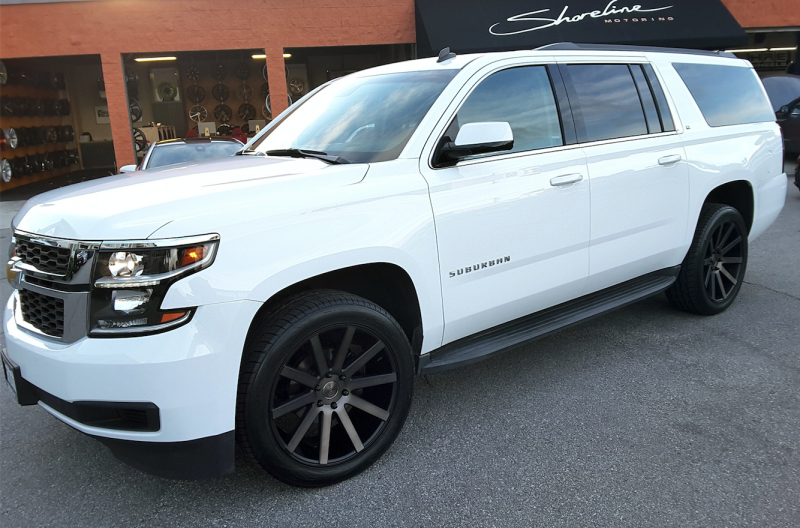 This includes 22" Black Rhino wheels in gloss black, custom painted grill and emblems and a PedalBox to enhance throttle response in the beast. 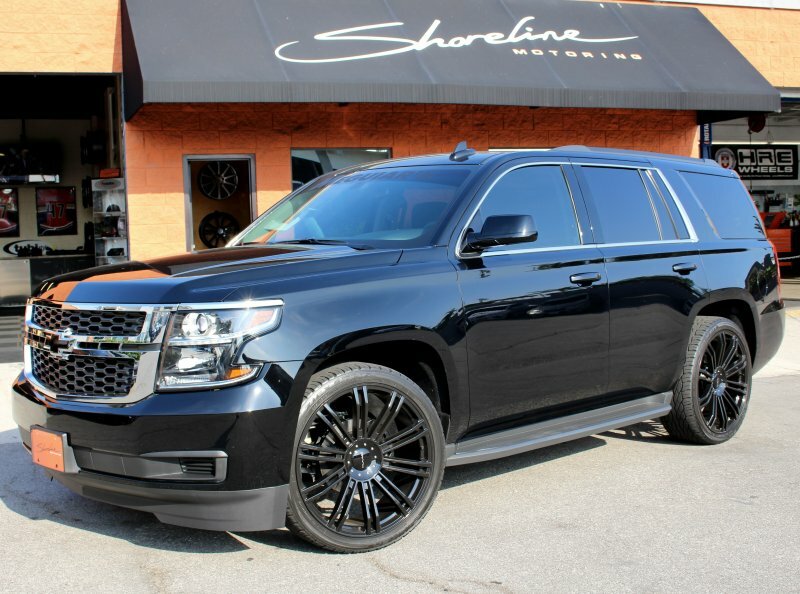 Tinted windows, a PedalBox, and 22" custom Black Rhino Malas for this beast. 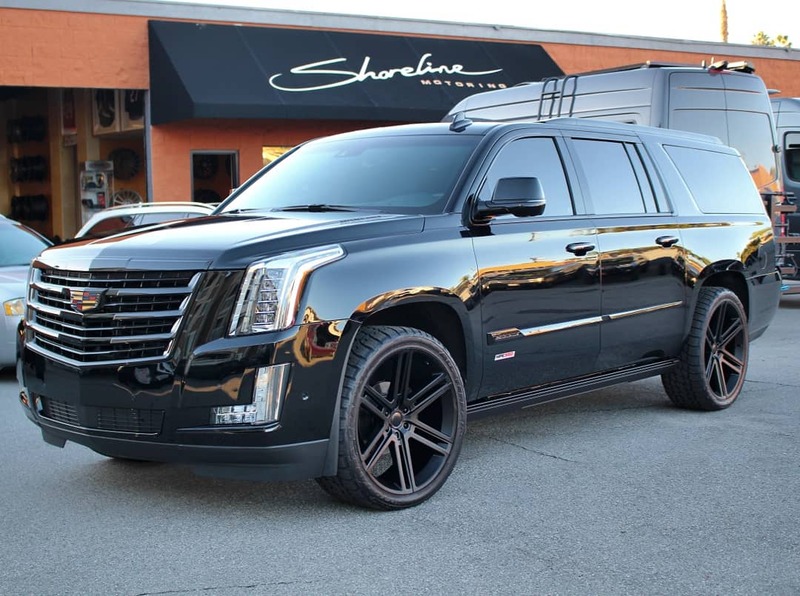 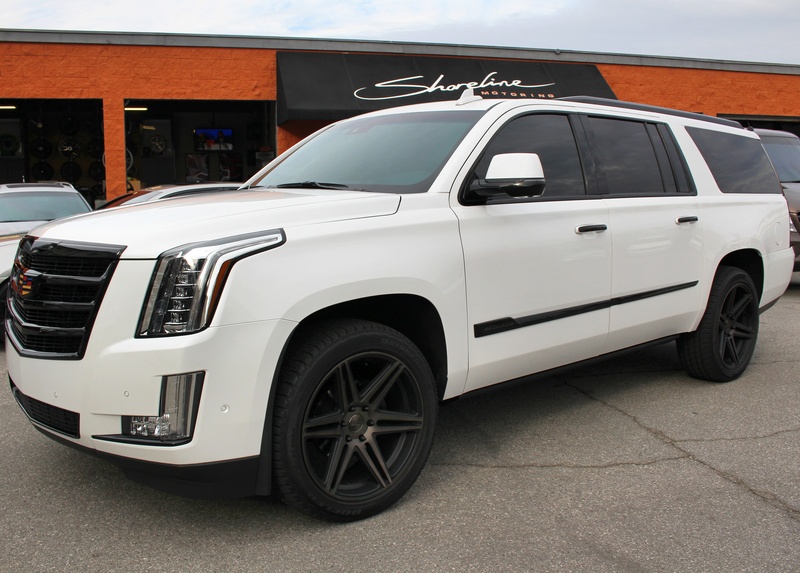 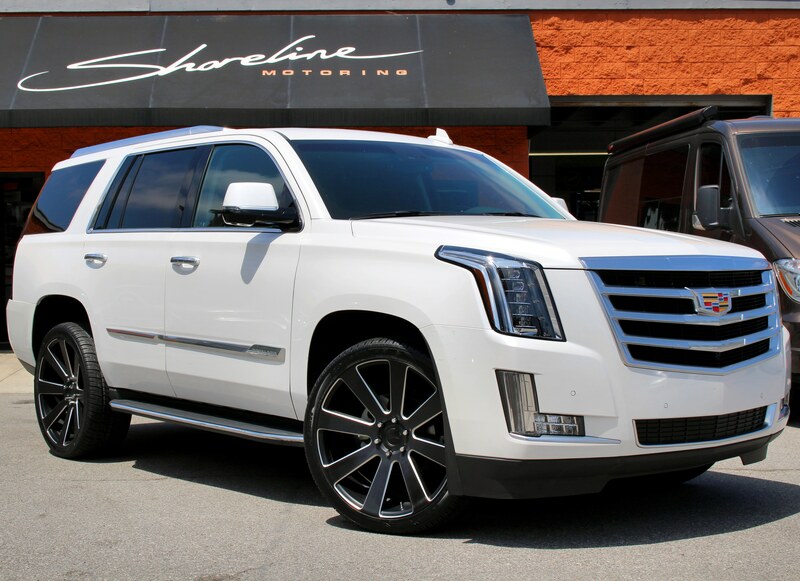 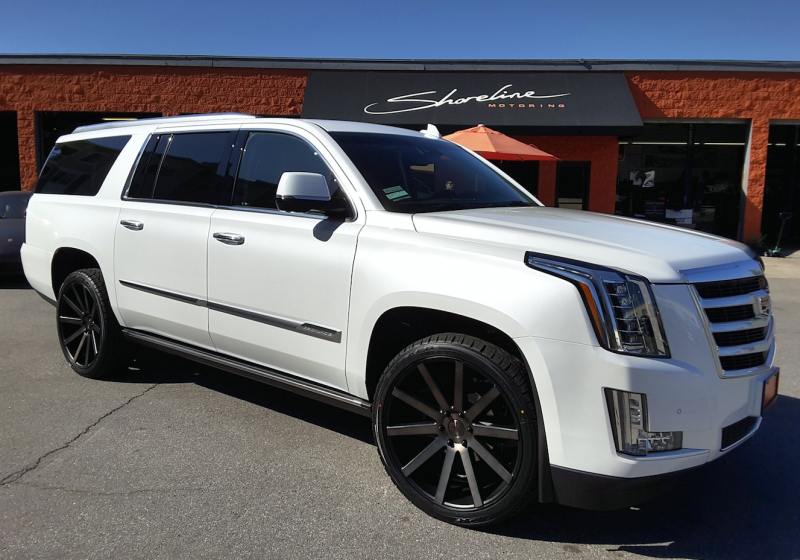 2016 Escalade in for 22" Black Rhino wheels and a PedalBox performance upgrade from DTE Systems. 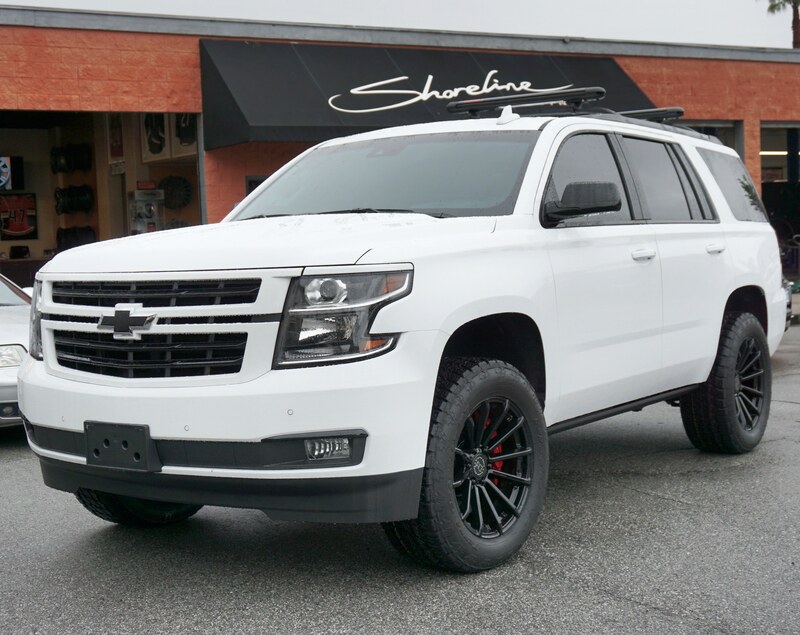 4" lift with upgraded suspension, 20" Fuel wheels, Toyo A/TII tires, custom mesh grills, paint work and a PedalBox performance upgrade. 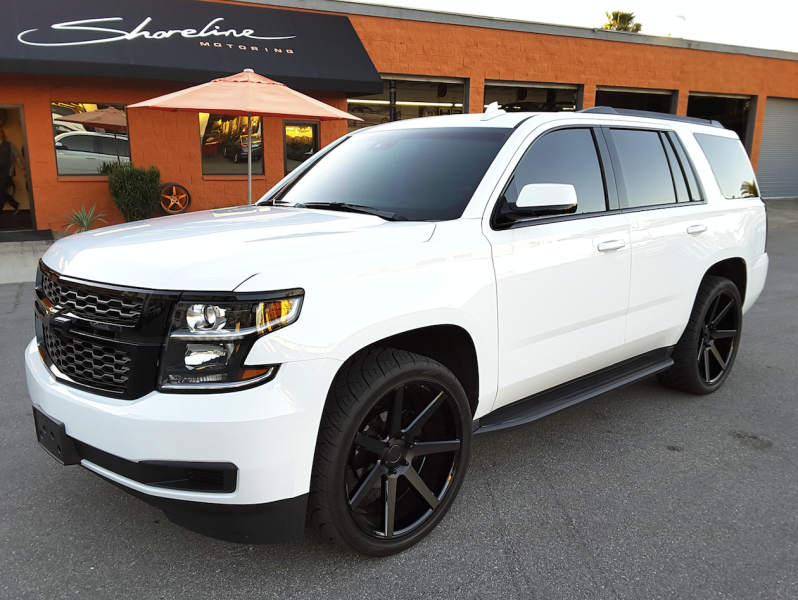 Tahoe lifted with FOX coil-over suspension and rides on FUEL M/T tires wrapped around FUEL Offroad forged "true" beadlock Trophy wheels. 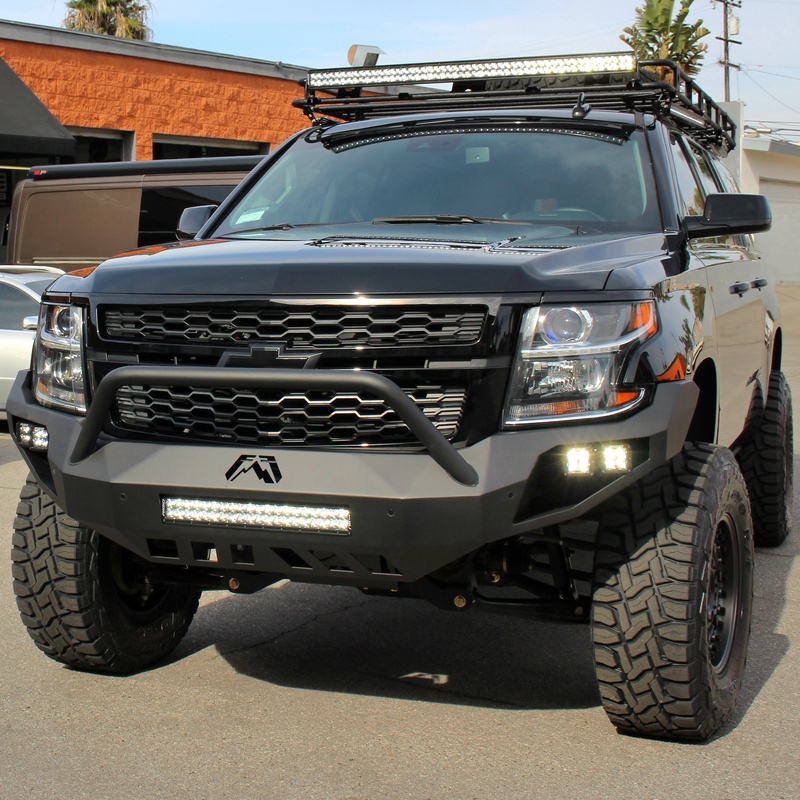 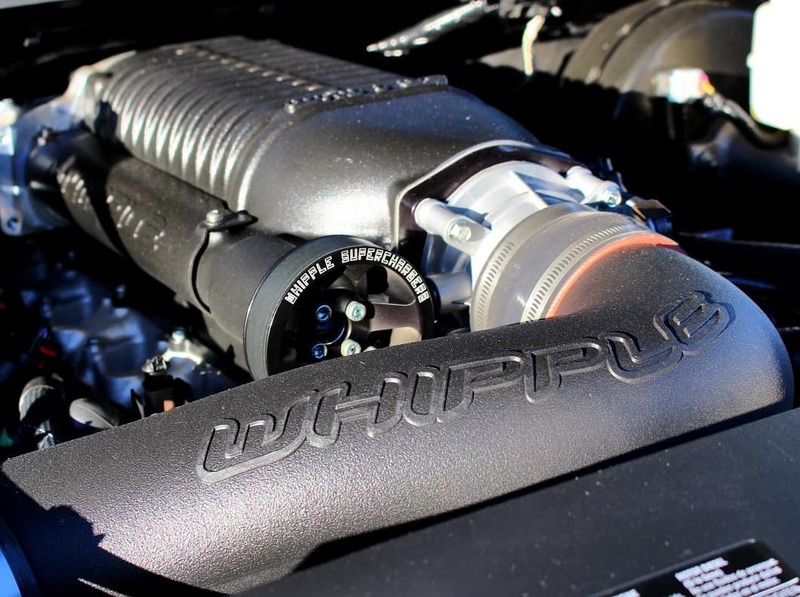 This suv also features an Edelbrock E-Force Supercharger and Rigid Industries LED lighting front and rear. 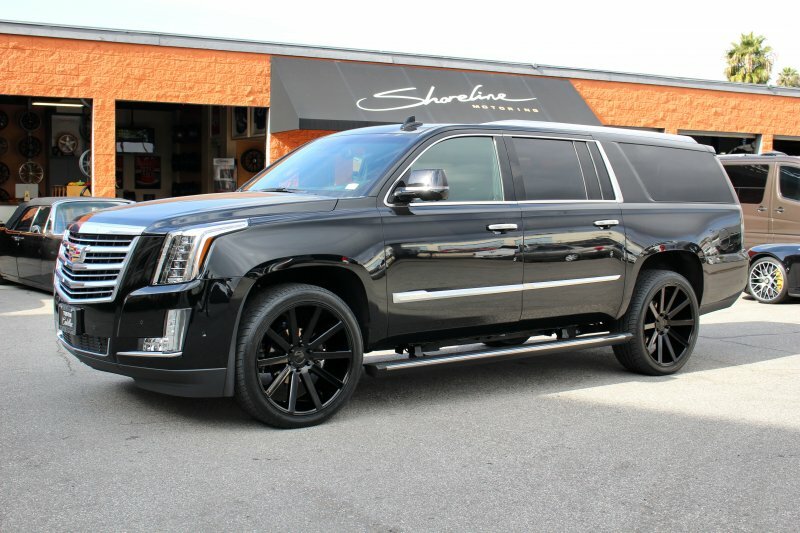 Gloss black trim package and a PedalBox performance upgrade for this Escalade. 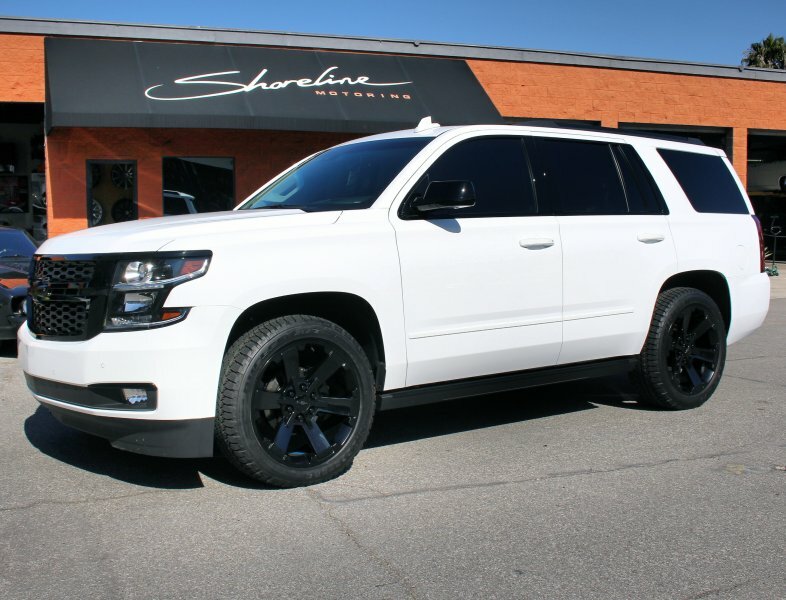 Tahoe in for 22" Black Rhino wheels, Toyo tires and a PedalBox performance upgrade. 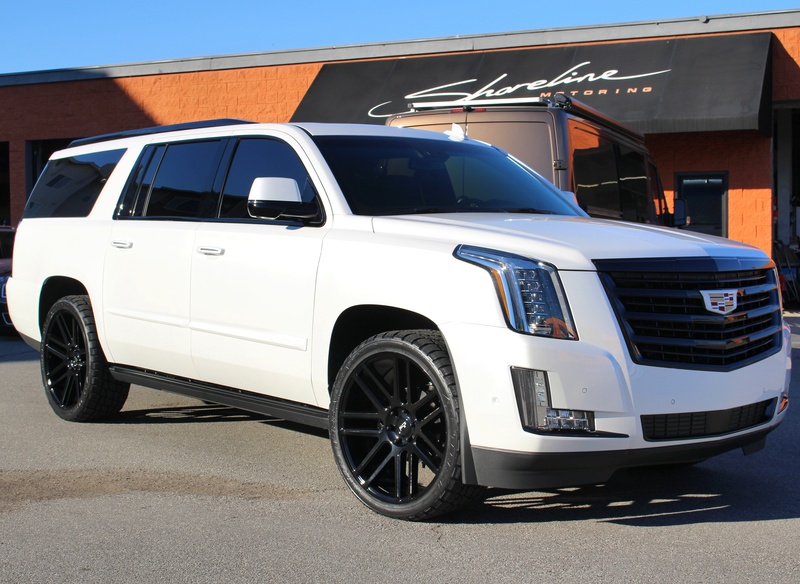 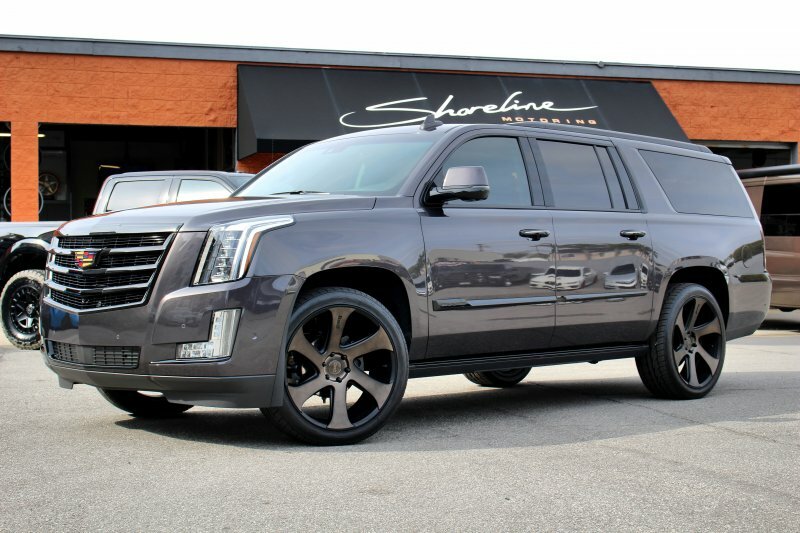 2015 Escalade in for 2 piece 24" Black Rhino wheels, Toyo tires and a PedalBox. 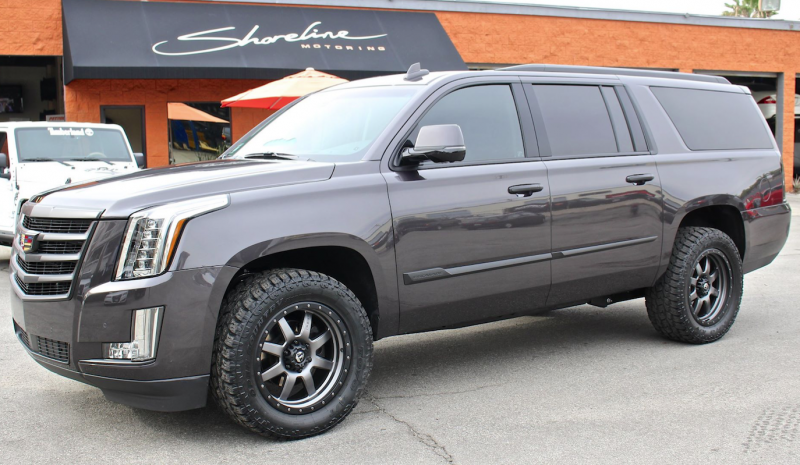 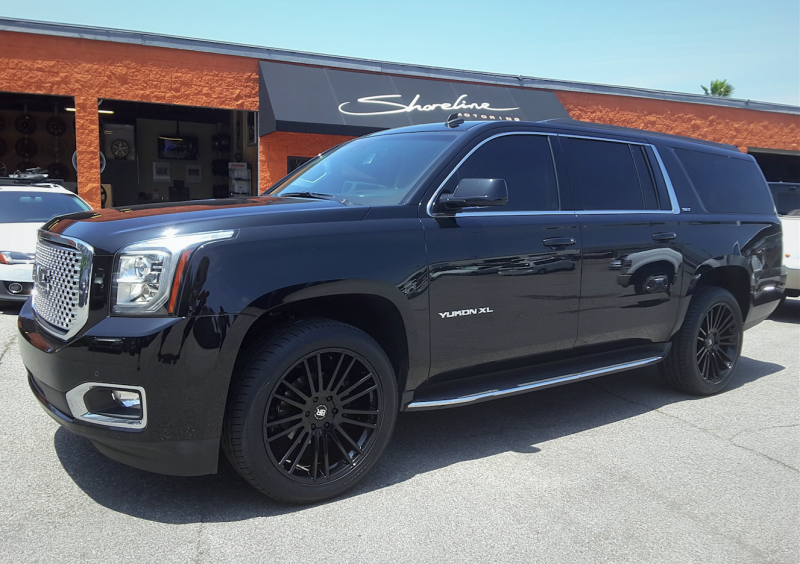 2015 Yukon in for 22" Black Rhino wheels, Toyo tires and a PedalBox. 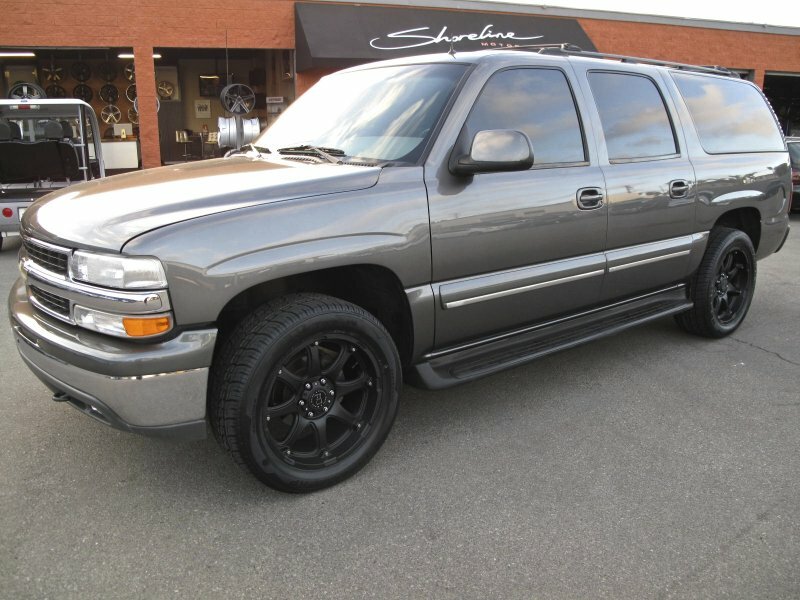 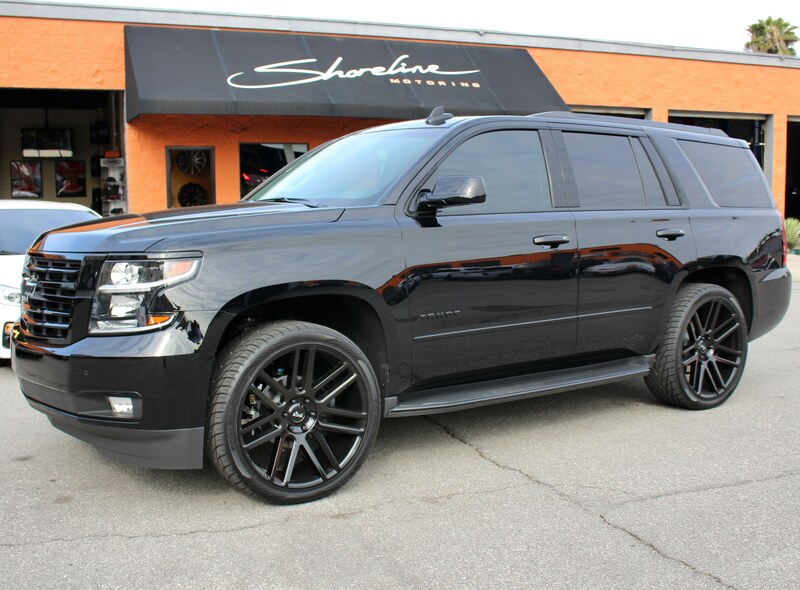 Suburban in for chrome delete black-out package, PedalBox performance upgrade and 22" Black Rhino Rotary Forged wheels. 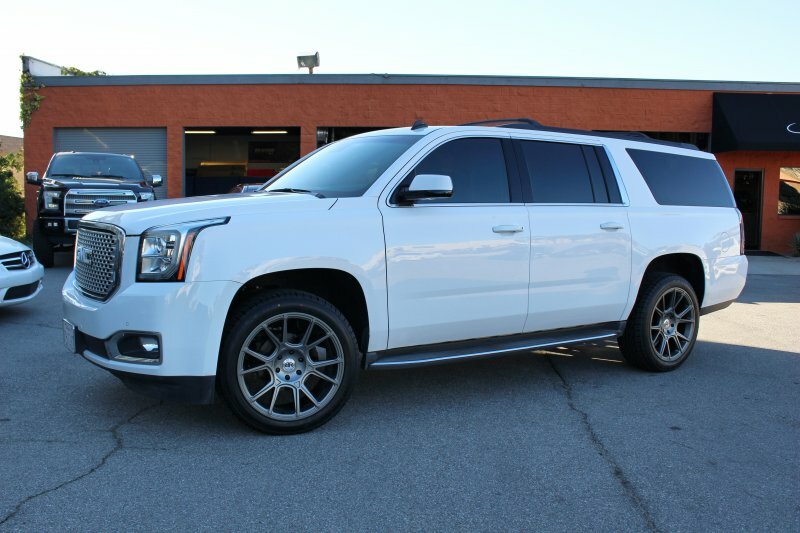 2016 Yukon in for 22" Niche wheels, Toyo tires and a PedalBox. 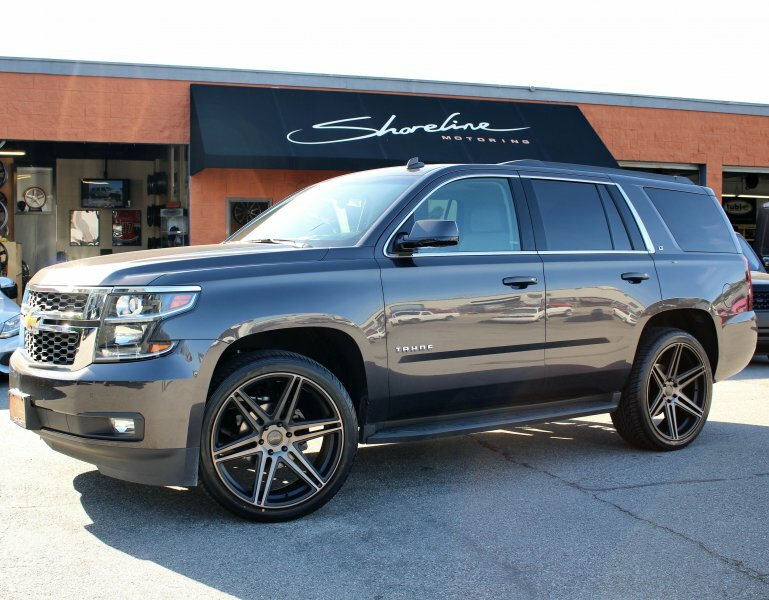 15 Suburban in for 22" Dub wheels, Toyo tires and a PedalBox. 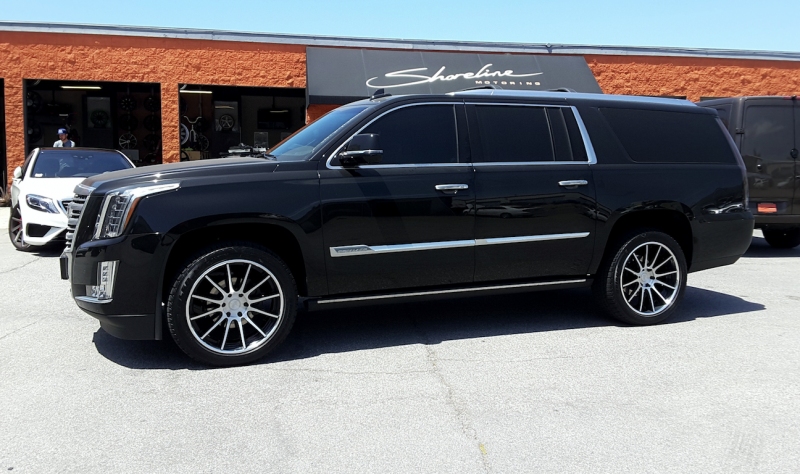 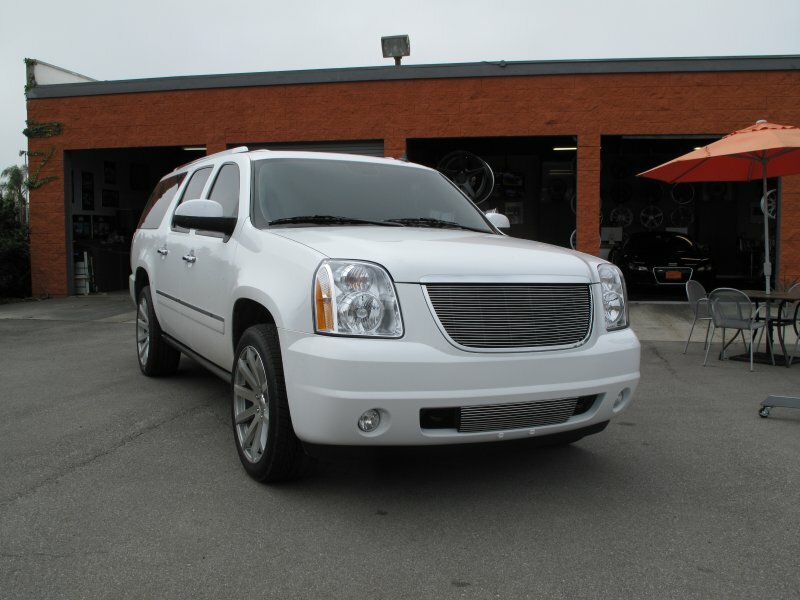 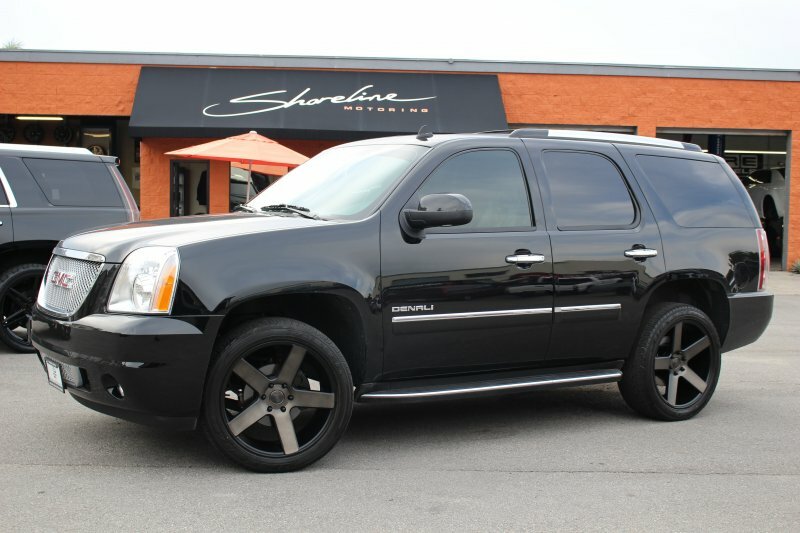 Yukon in for 22" Black Rhino wheels, tint, custom paint work and a PedalBox. 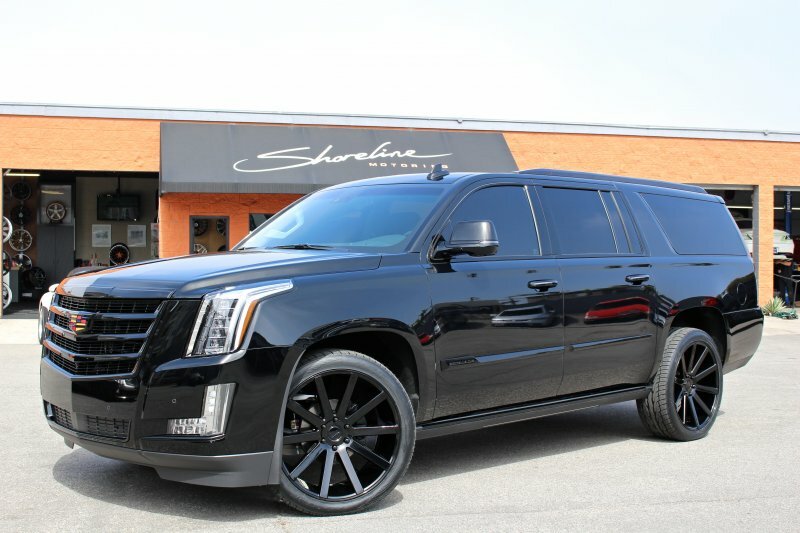 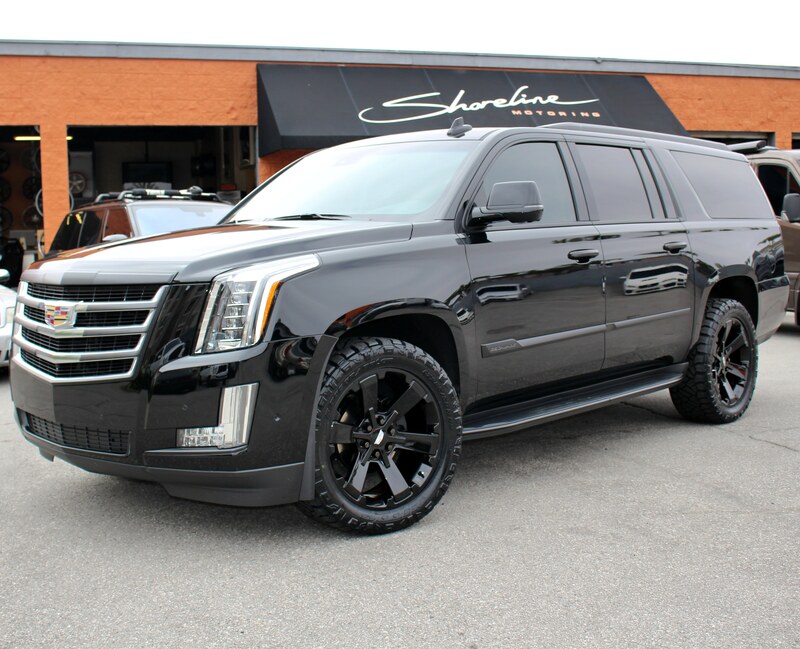 Escalade in for 24" Black Rhino wheels and a PedalBox. 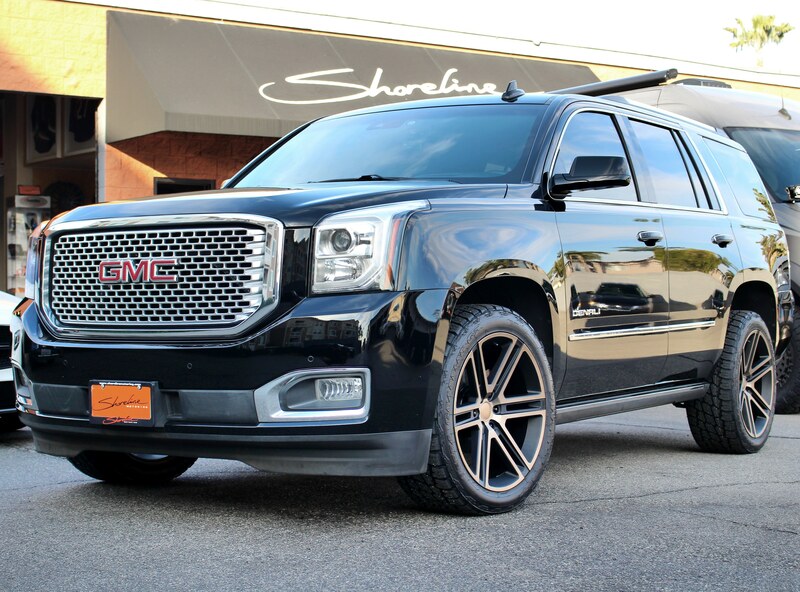 16 Yukon XL with 22" Black Rhino Wheels and PedalBox performance upgrade. 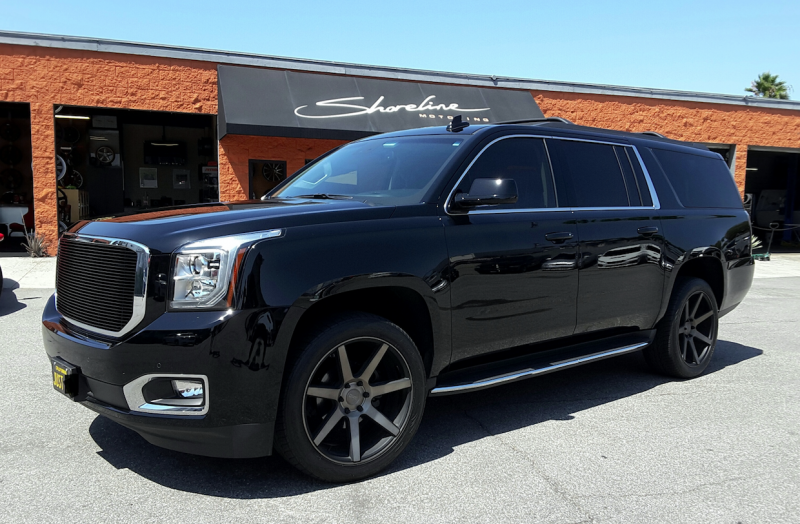 2015 Yukon with 22" Black Rhino Wheels, Toyo Tires and a PedalBox performance upgrade from DTE Systems to enhance the power response. 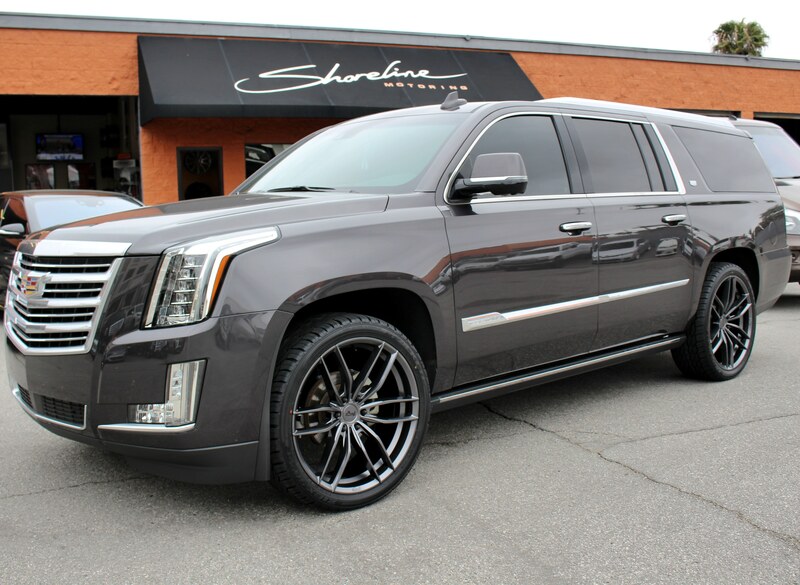 2016 Escalade in for 22" custom forged Niche "Agile" wheels. 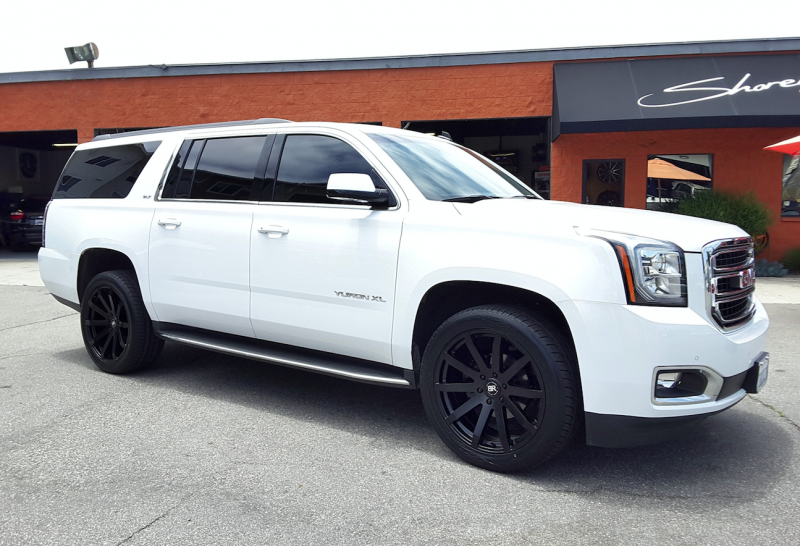 2016 Yukon in for 22" Dub wheels, Toyo tires, tint and a PedalBox performance upgrade. 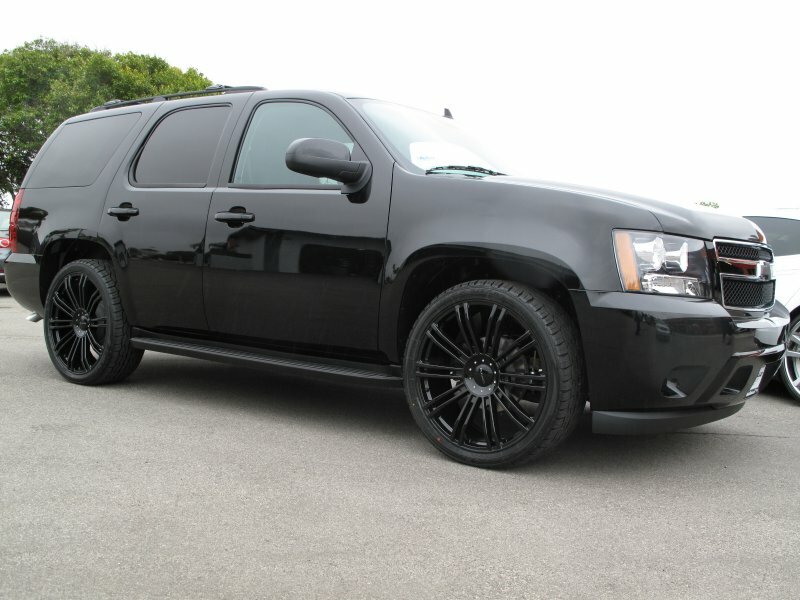 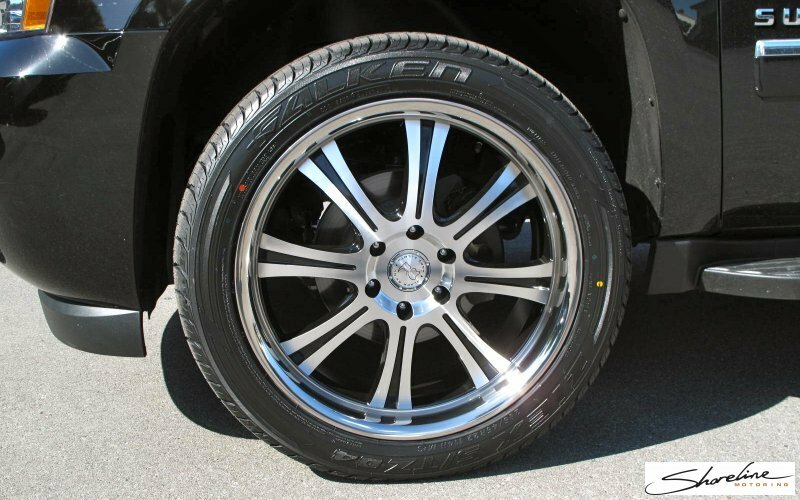 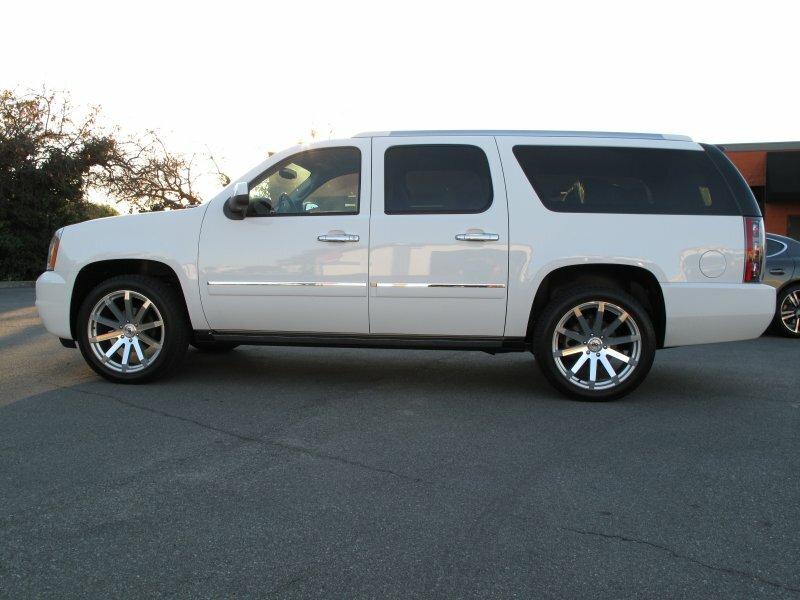 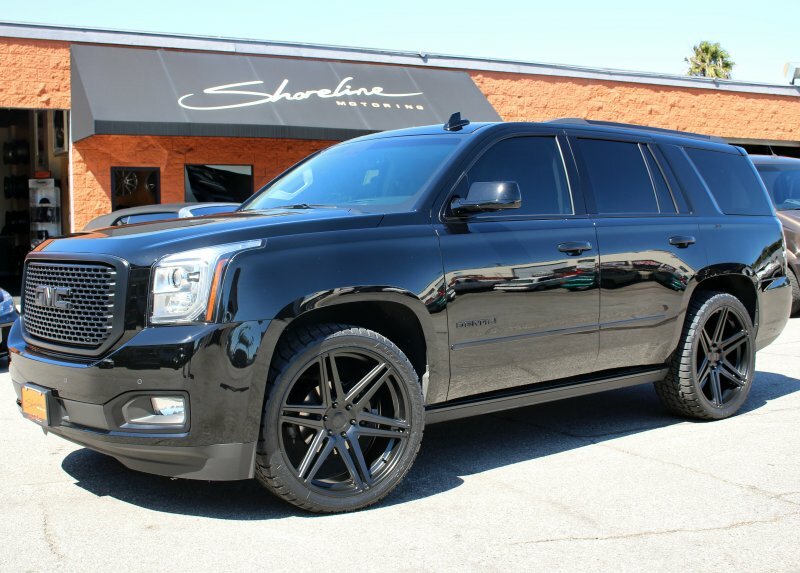 Tahoe lowered with 24" KMC D2 wheels in gloss black finish. 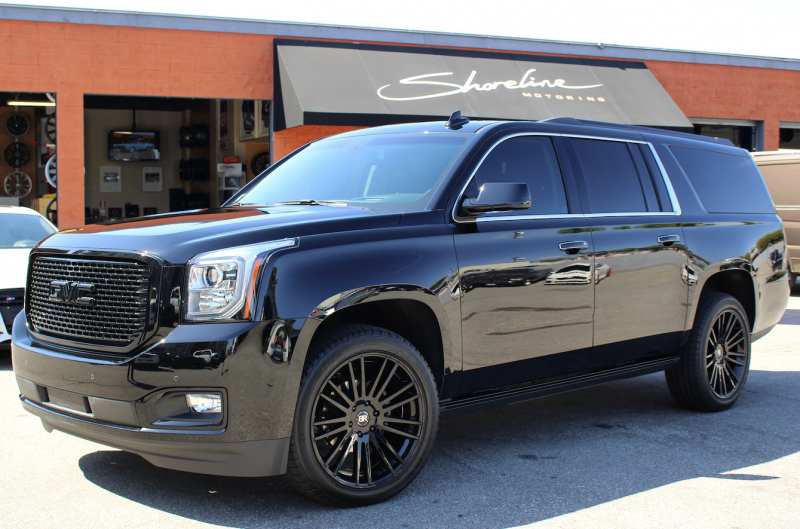 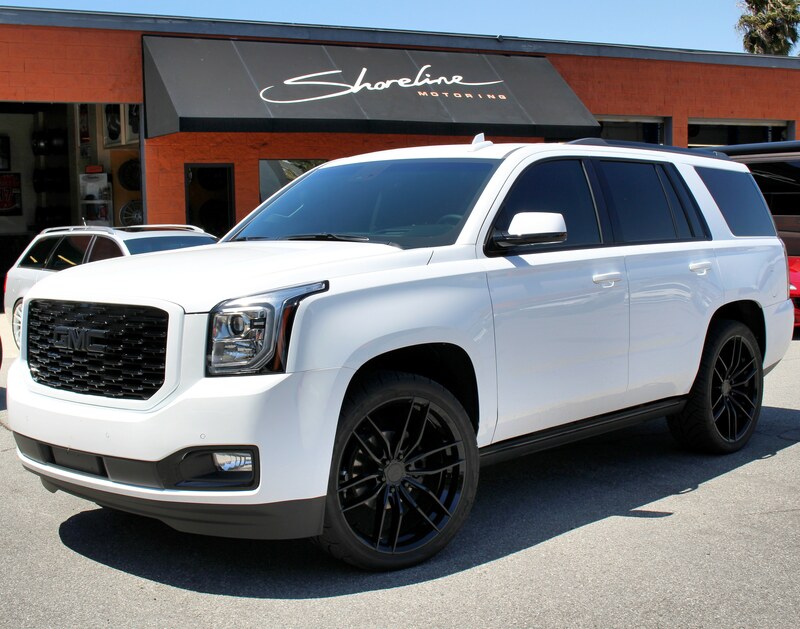 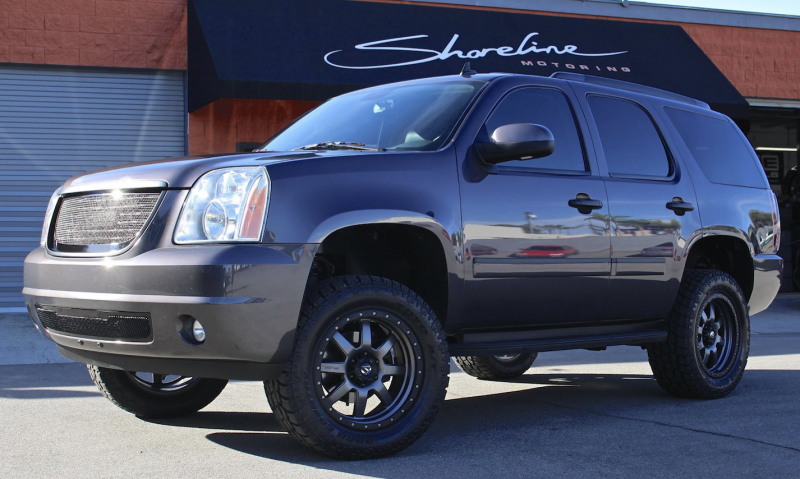 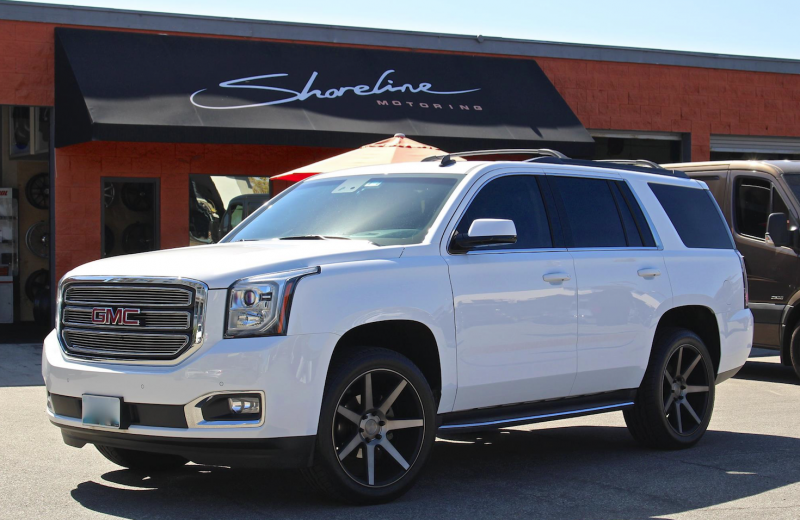 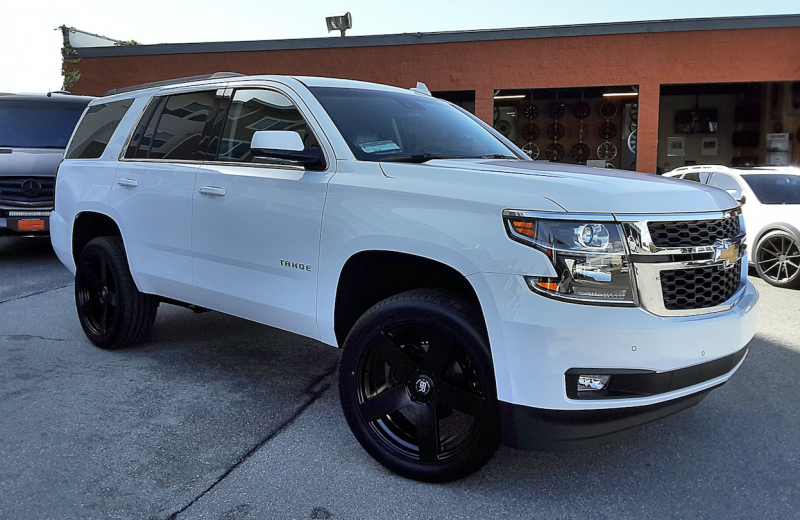 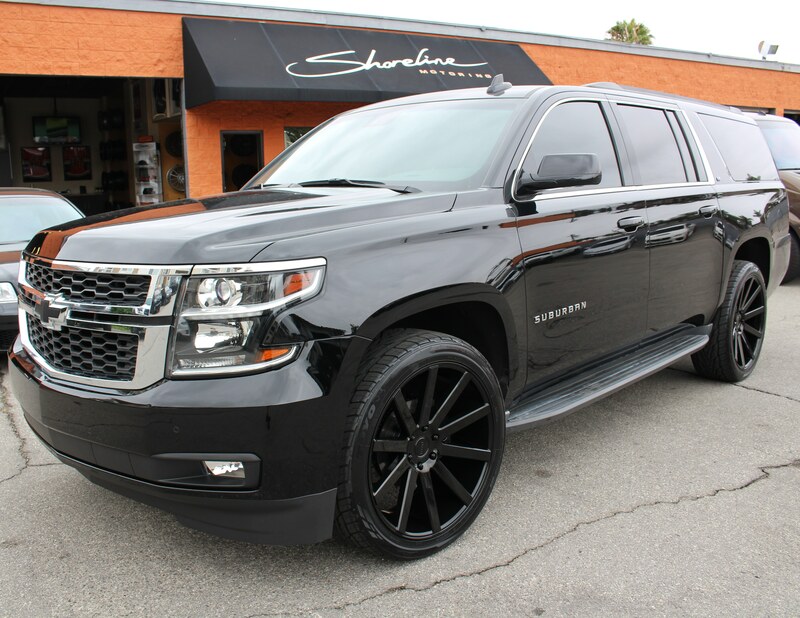 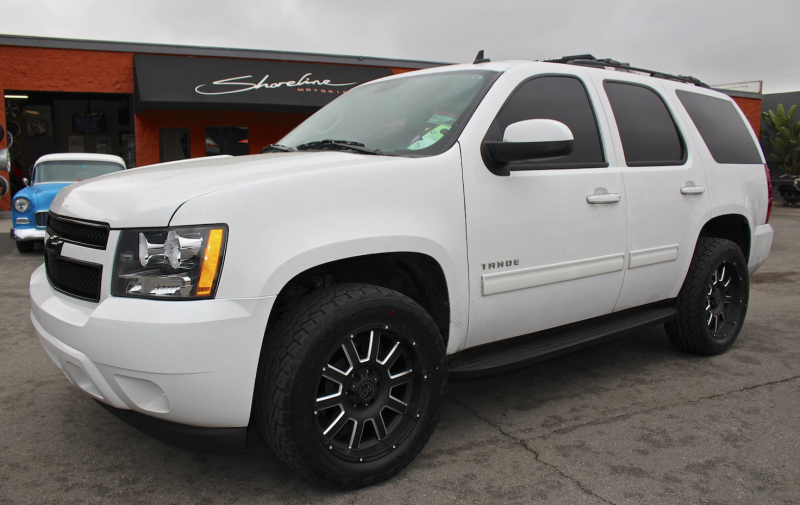 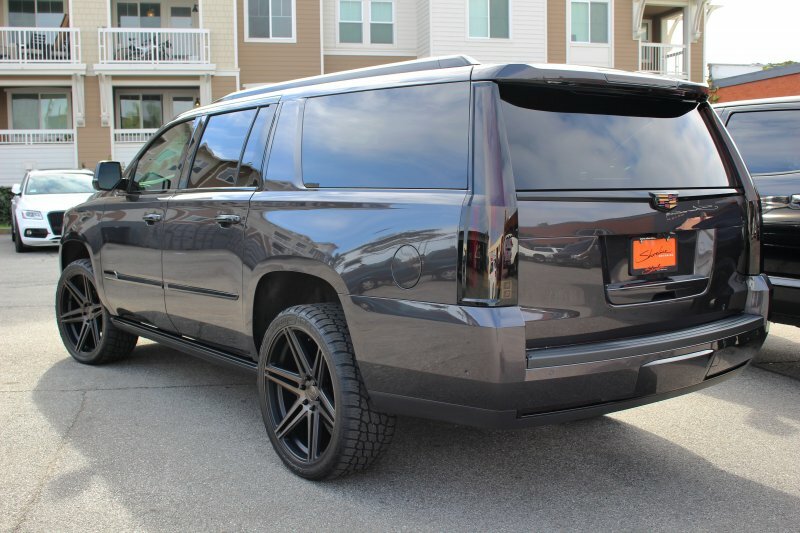 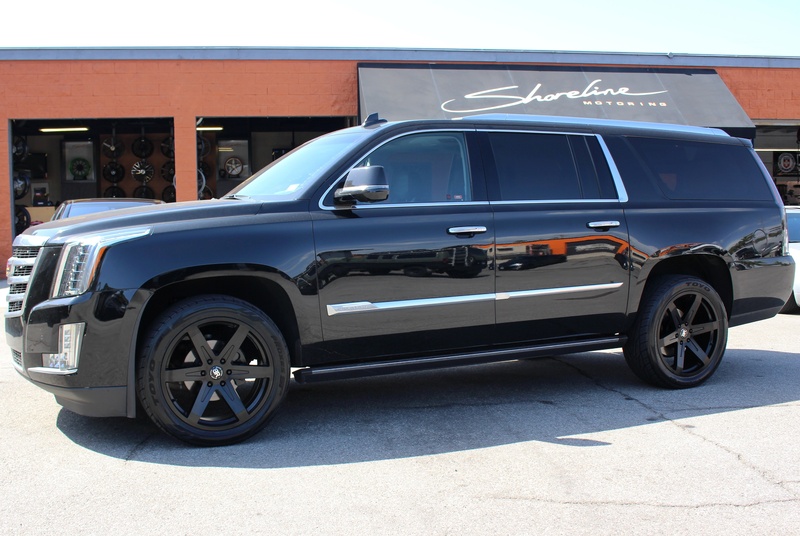 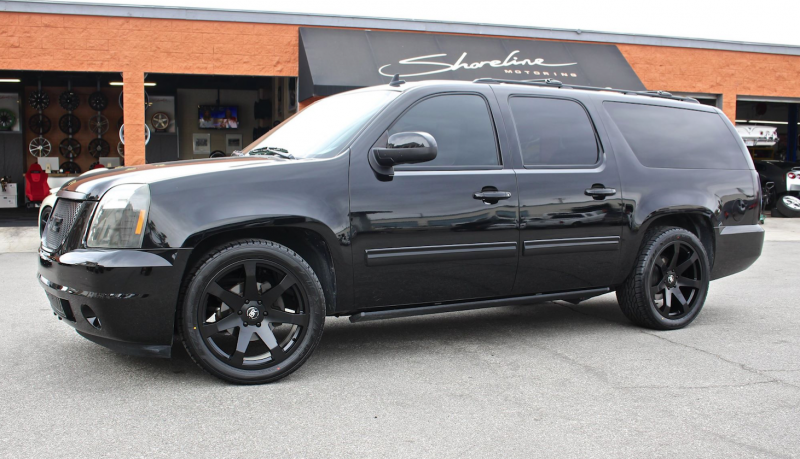 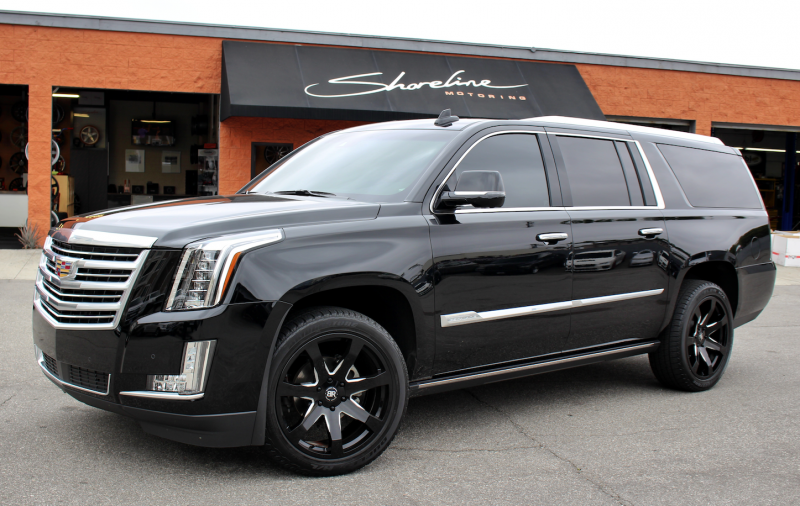 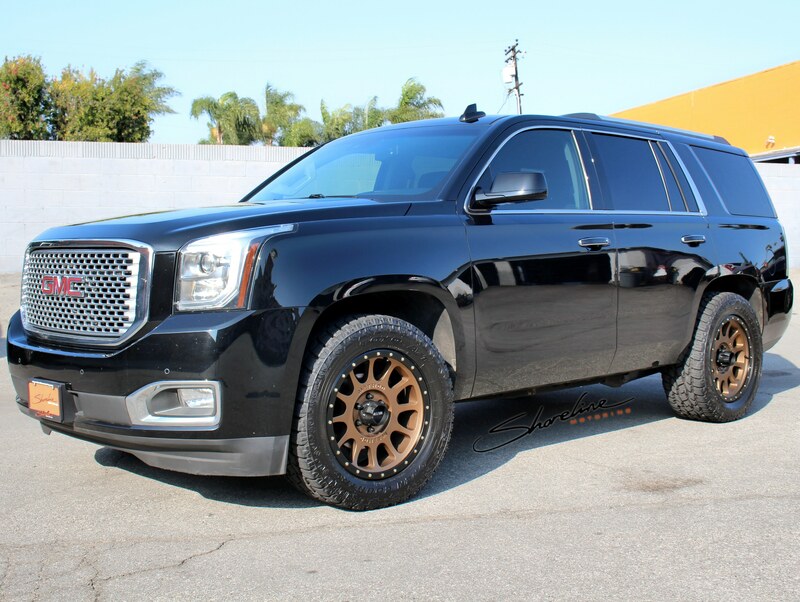 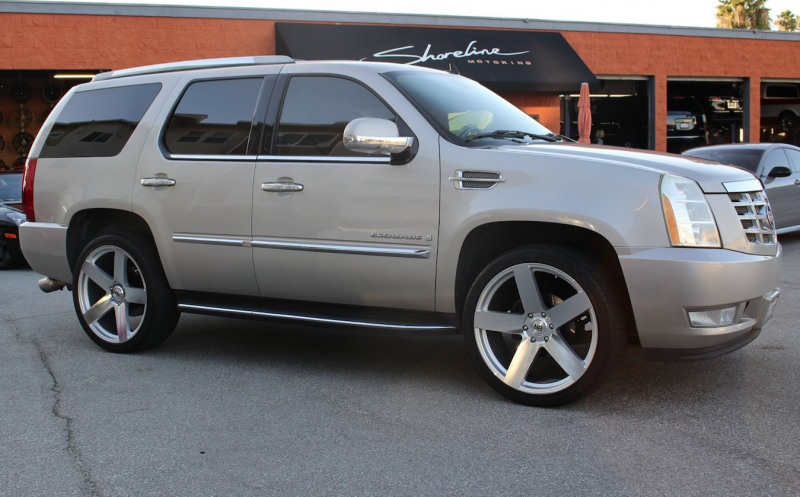 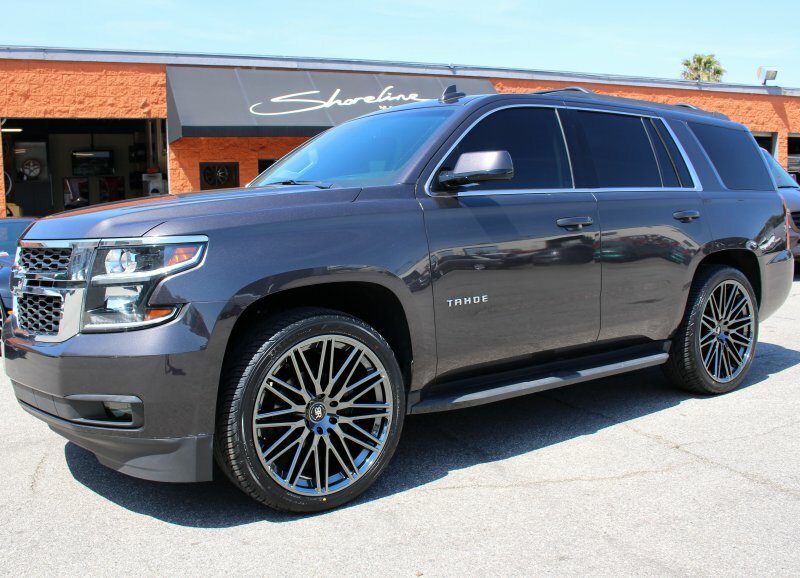 Tahoe in for 20" Black Rhino wheels, custom paint work and a PedalBox performance upgrade. 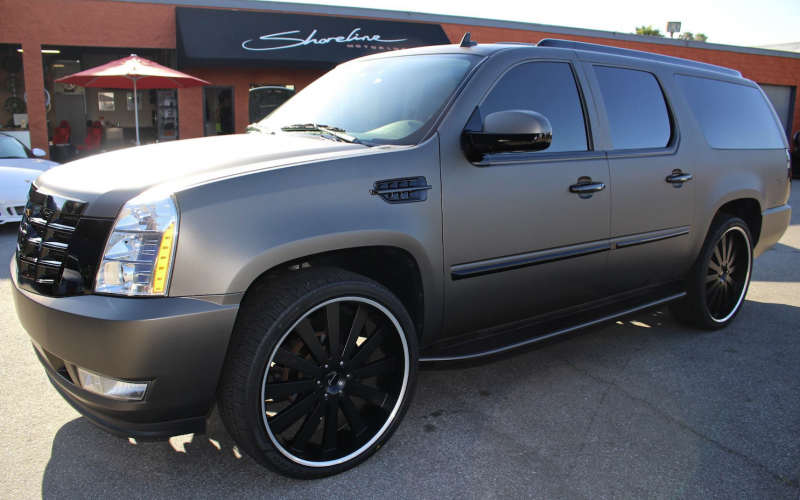 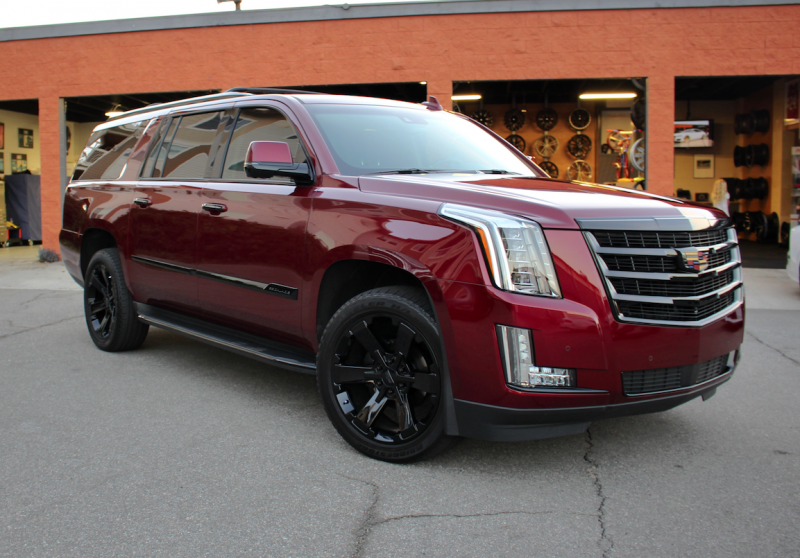 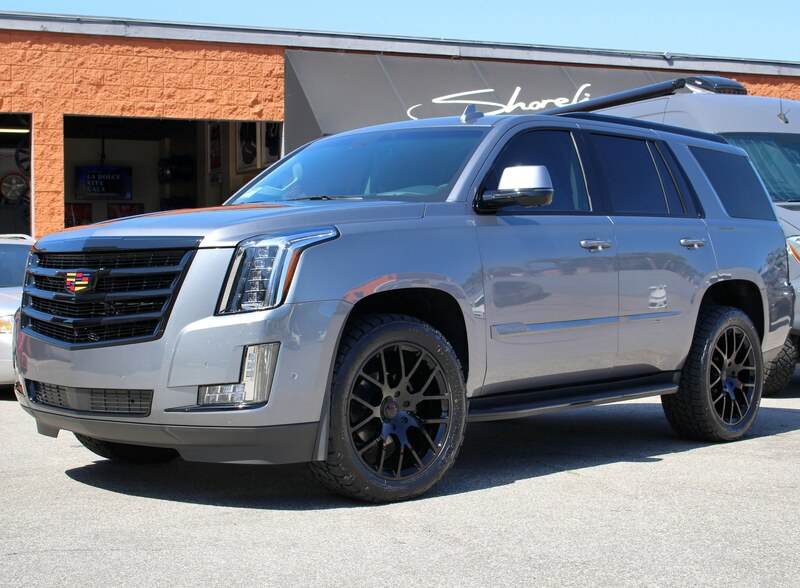 Escalade in for a full matte charcoal wrap, custom painted trim, custom wheel and tire package and a PedalBox. 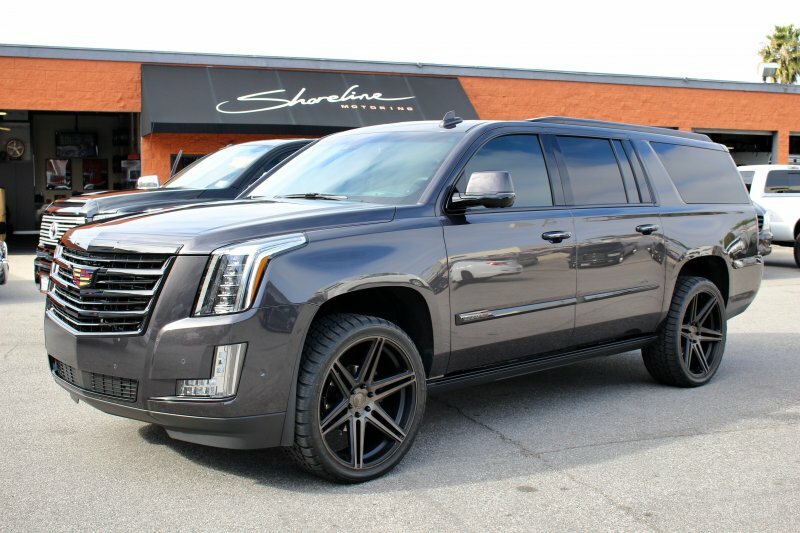 Escalade in for 24" KMC wheels and a PedalBox. 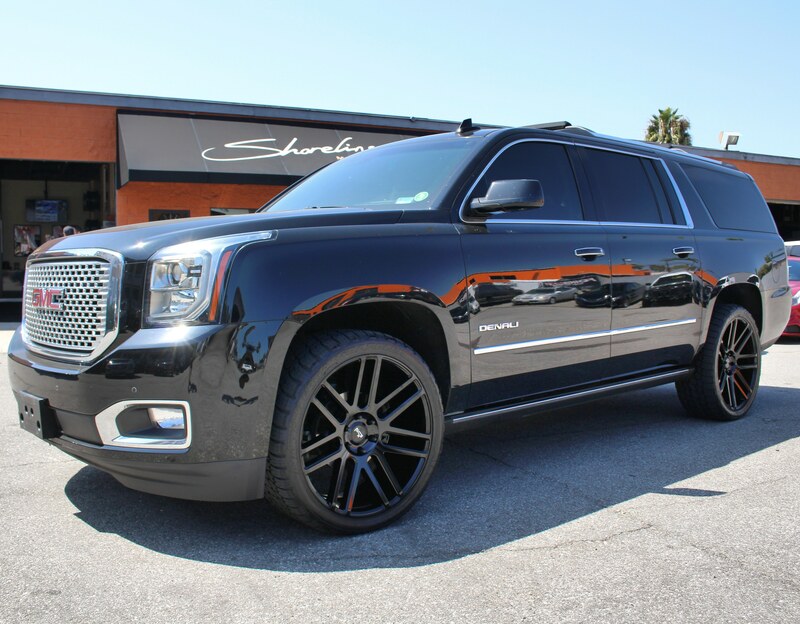 2014 Yukon Denali with 22" Dub "Baller" wheels from MHT, finish is matte black with dark tint over machined face. 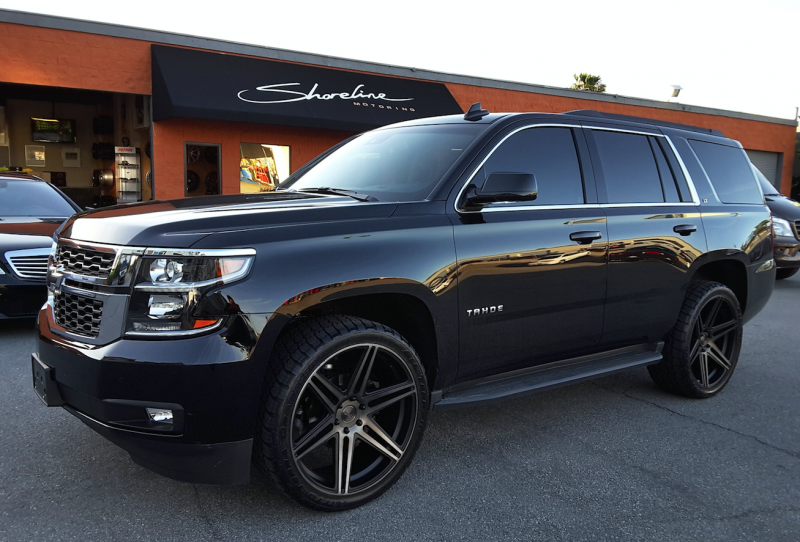 Suburban with 20" Black Rhino Glamis wheels. 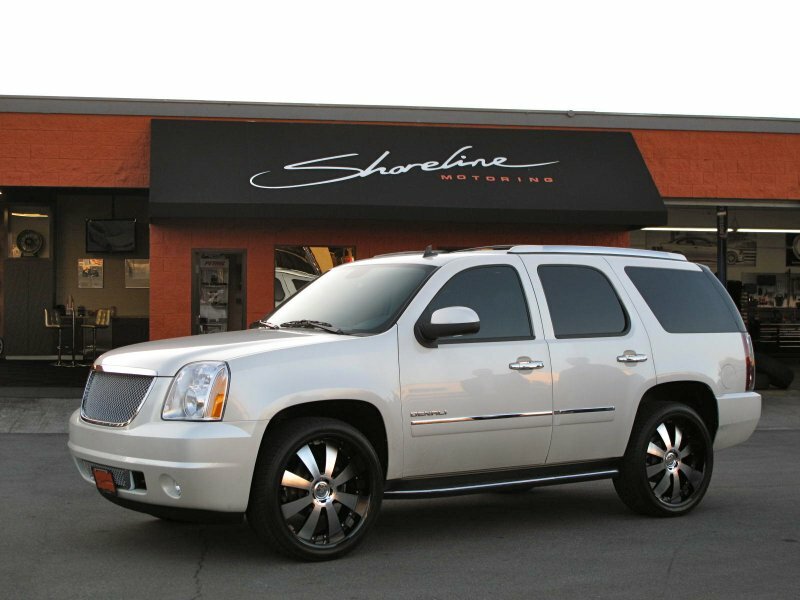 T-rex billet grille upgrade on 2013 Yukon Denali. 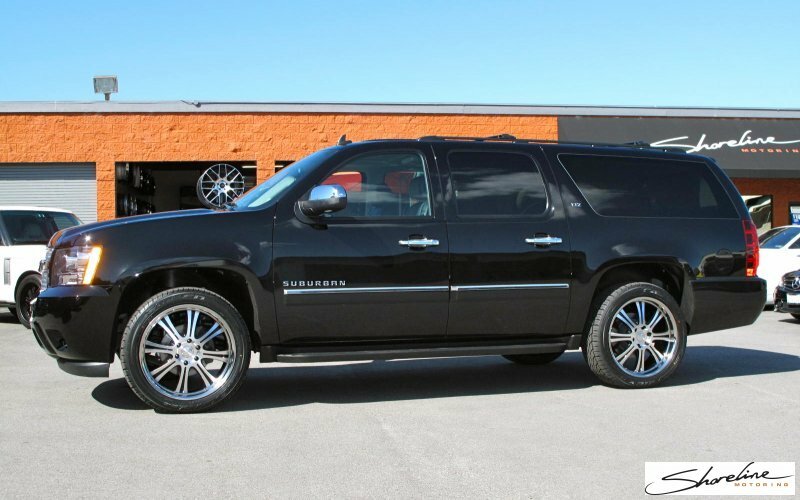 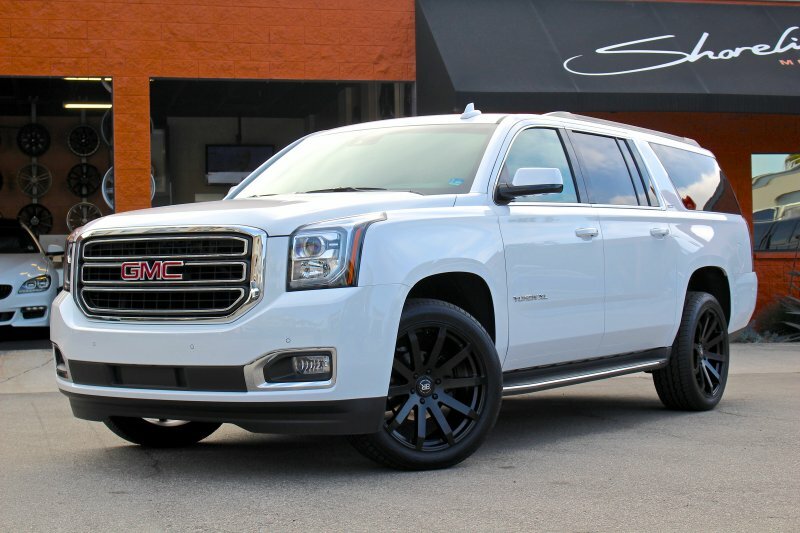 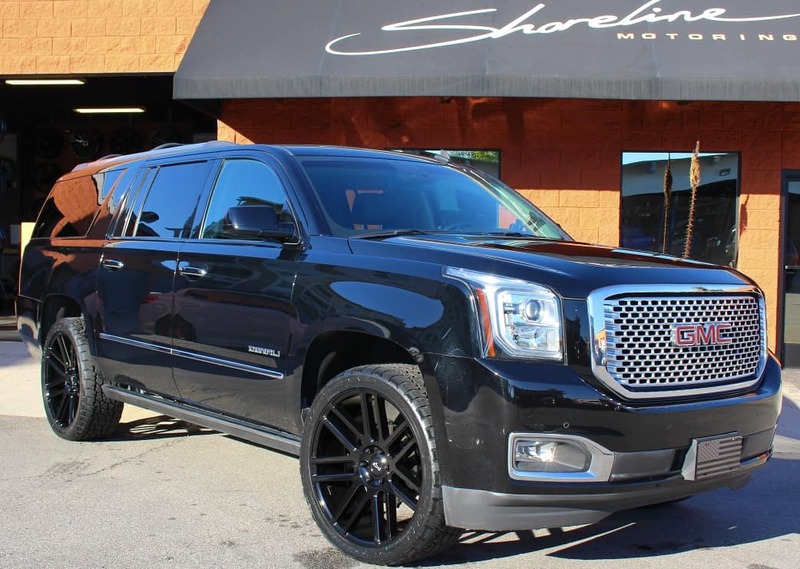 2013 Yukon Denali with 22" Black Rhino Traverse wheels in silver with mirror cut face and Toyo tires, other upgrades include a Magnaflow exhaust, T-rex billet grilles and headrest DVD monitors. 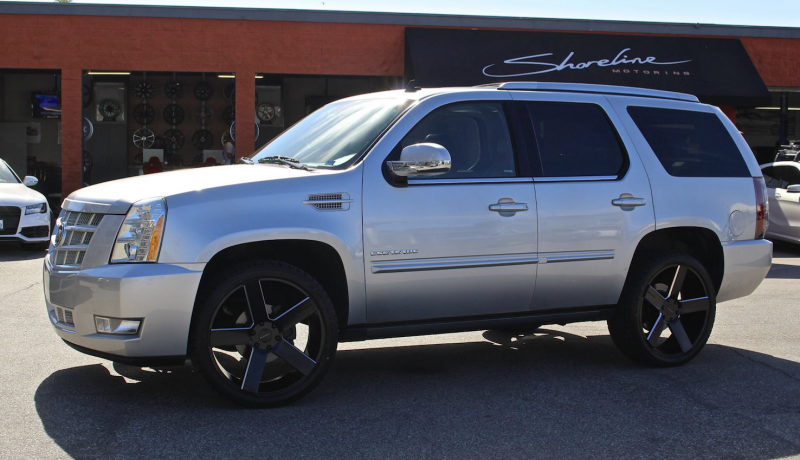 Chevy Tahoe rolling on 22" Black Rhino Traverse wheels, and Toyo Proxes ST2 tires. 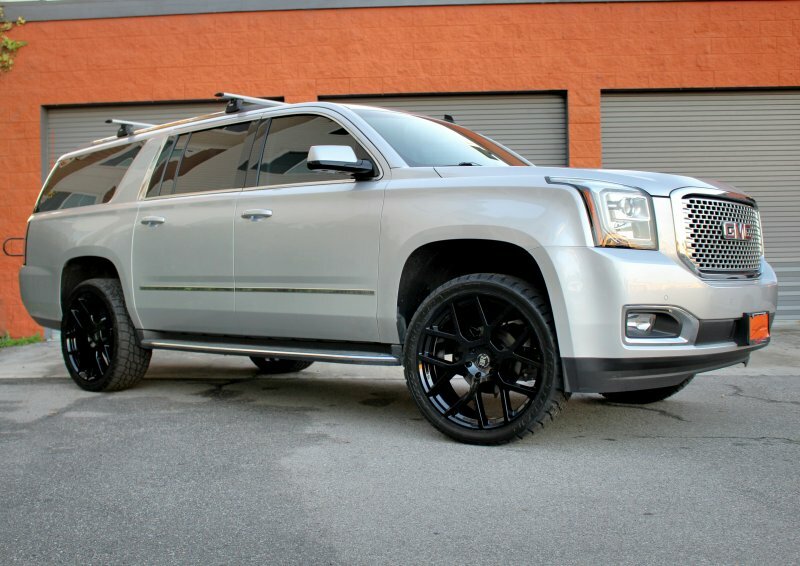 2012 GMC Yukon with 24x10 DeModa Concerto and Toyo tires. 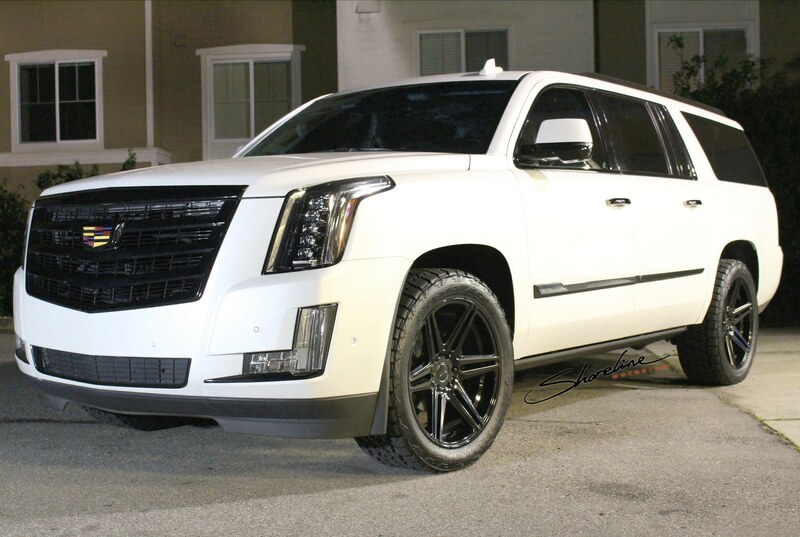 Escalade on 24" DeModa Concerto. 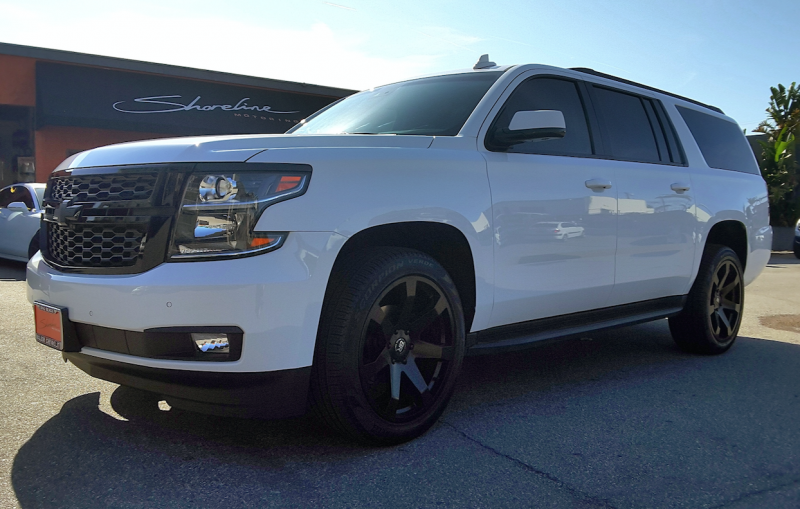 Sometimes, less is more: Black Rhino wheels, tint and lowering by Eibach. 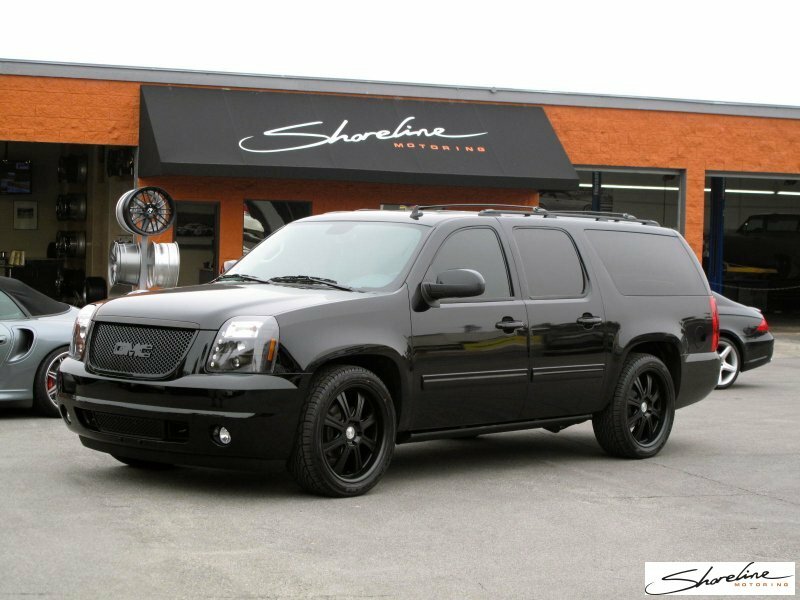 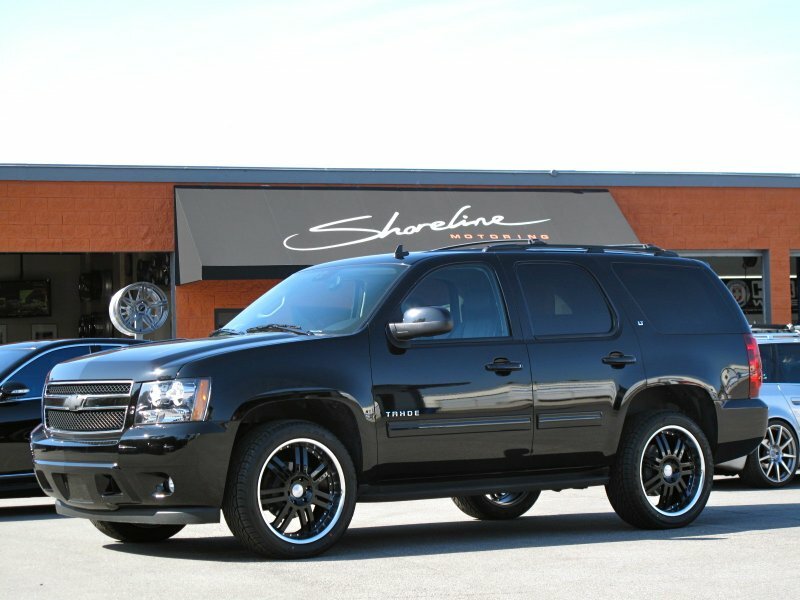 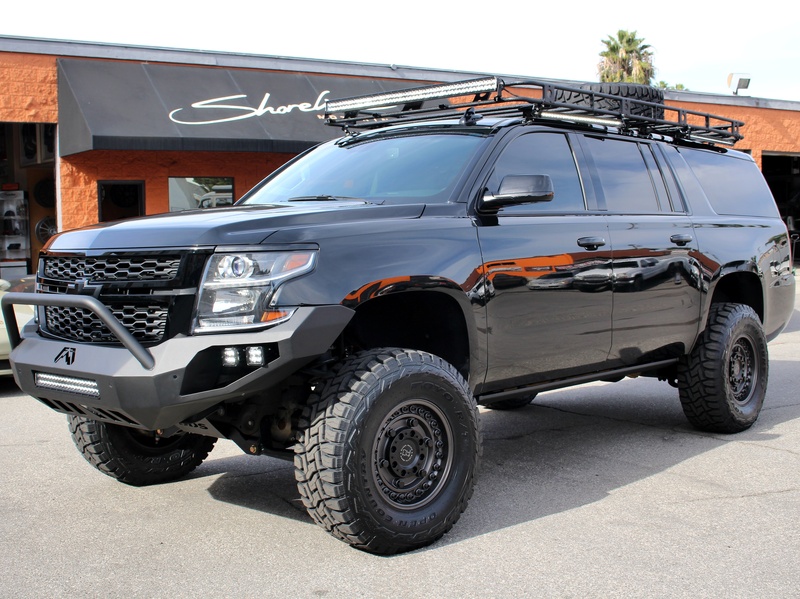 Eibach sets the Suburban down on 22" Black Rhinos. 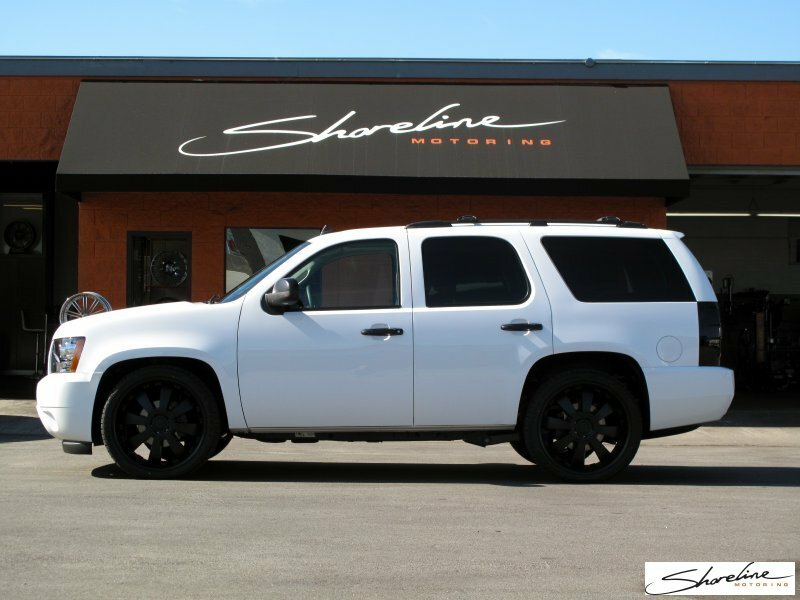 Lowered Suburban on 22" Black Rhino wheels. 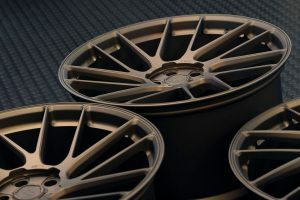 Black Rhino Sabi in machined black finish. 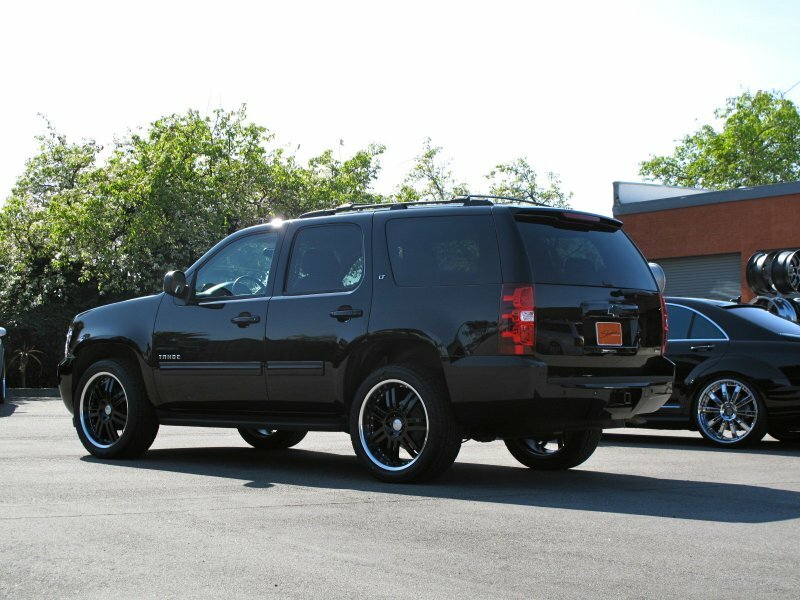 Black Rhino Sabi machined finish: 22". 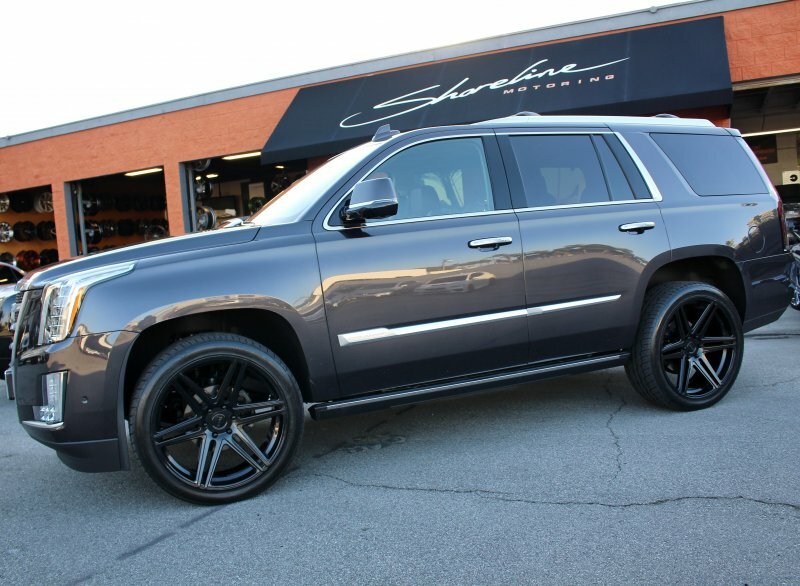 DeModa Concerto 24" wheels and lowering: custom finish. 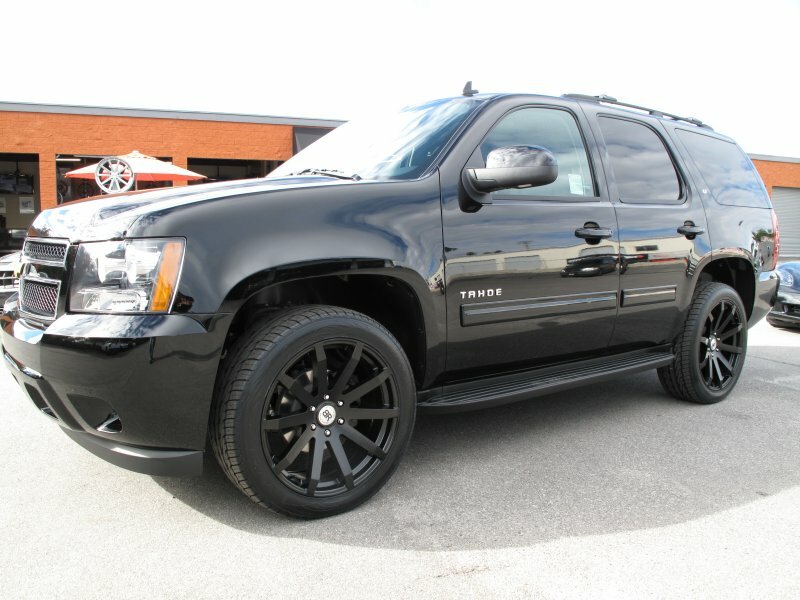 Lowered Tahoe on 24" Elite Phase 6 and Falken tires.